The Northern Greens picked up roughly a half foot of new snow thanks to the storm that came through yesterday. There was actually a general 3-6” of accumulation up and down the spine, with the southern resorts catching the lower end of that range. Although this was a rather modest storm, the past couple of weeks have been pretty lean on snowfall, so it was a nice way to put an end to the bout of dry, arctic air that had been hanging out in the area. We picked up 4.5 inches of snow at our place in the valley, and that actual turned out be our largest storm so far in 2013. The snow quality was certainly good; my analyses revealed water content of 5% H2O for the snow that fell through the afternoon, and then 4.3% H2O for the additional snow in the evening. With the conditions already quite good based on observations from my outing on Sunday, and Bolton Valley reporting 5” of new snow up top, it was definitely a morning to hit the slopes. I contemplated heading up to the main base to get the most snow, but as I drove past Timberline it looked pretty good so I decided to check it out. I went back and forth for a few moments about which base to visit, and eventually decided to stay where I was because it was generally quiet and I was hoping I could keep out of the way of any grooming equipment. There were a couple of other cars were parked below the center island below the lodge, which meant that there might be a skin track already in place. It was a nice morning – it was cloudy, but there was no wind and the temperature there at 1,500’ elevation was 22 F. That was very pleasant after the arctic temperatures we’ve recently seen. 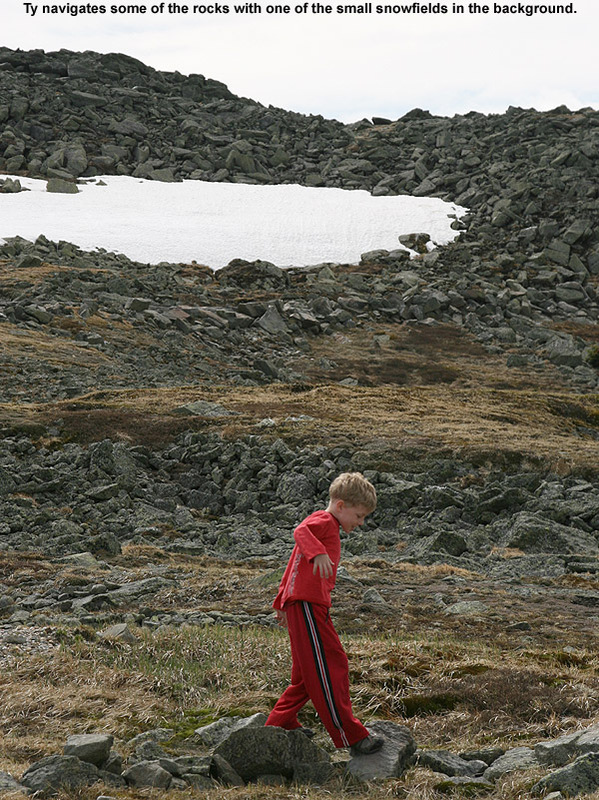 I began my ascent and followed the skin track that people had established on Twice as Nice. 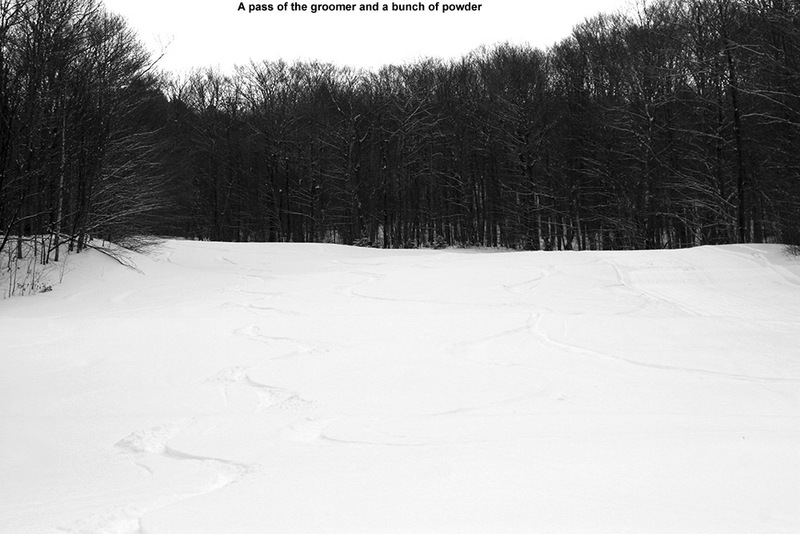 My depth checks on the powder consistently revealed 4” new, which is what Bolton reported for the base elevations. For the descent I headed over to Spell Binder, since a groomer was working on Showtime, and there were already a couple of tracks and a groomed strip on Twice as Nice. 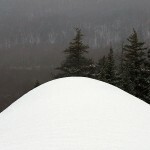 I’d forgotten that the mountain could make snow on Spell Binder, but they’d made some snow on the upper headwall area. There were some huge snow whales there, which they’ll have to spread around at some point. The approach to skiing the steep terrain on the headwall was a toss up. One option was to ski on some of the manmade snow, but there were some tricky snow formations made by the guns, and the 4-5 inches of snow wasn’t enough to keep you from touching down on that dense manmade surface. 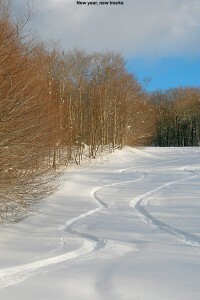 The other option was to ski the sides of the trial that had not seen snowmaking. The base snow was of higher quality, and there had been additional round of powder on top of it, but there were spots of poor coverage where snow had been swept away by winds. I ultimately made use of both options, going where my line took me. I was a bit conservative in my skiing of the headwall since I didn’t want to hit any rocks that might be lurking under the snow, but once I was below that, the rest of the trail was in another league in terms of snow quality. Since there hasn’t been much traffic in a while, the combination of the most recent snow and lighter events from last week provided 8-10 inches of beautiful powder over a smooth base. Sunday’s turns were certainly good, but with the addition of this latest storm, these were the deepest turns I’d had in a couple of weeks. The top levels of the snow were in that 4-5% range of H2O content, and there was a nice gradient of more dense snow below. It was that combination that powder skiers seek for great turns. The addition of this latest storm has certainly helped the meager snow totals that we’ve seen this January. We’ve now had almost 22” of snow at the house this month, however, that’s still only about half the average I have in my records. 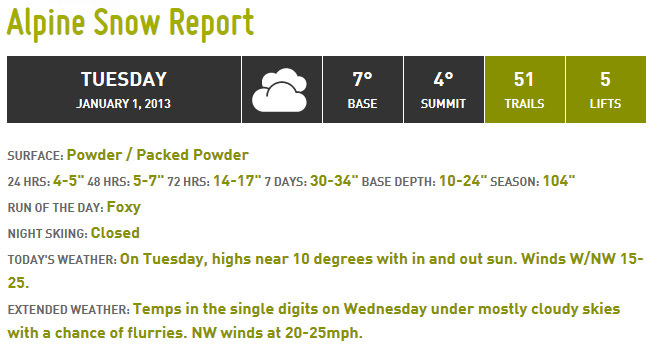 Tomorrow is supposed to be a warm day, so this latest round of powder is going to settle down, but the forecast says we’re back into the cold tomorrow night into Thursday, with some chances for snow. No large systems are expected, but some Clipper systems may come through in the next several days, and the Greens can usually do something nice with that moisture and often pull out totals just like we saw today. We’ve had arctic air in the Northeast all week, which has made it one of the coldest and driest periods of the season. With the lack of moisture there’s been only an inch of snow at the house in the past seven days, and although Bolton Valley was reporting a similar accumulation, they had picked up a few inches since I was last there for my backcountry outing on the 19th. I also suspect they’ve picked up various small accumulations of dry arctic snow similar to what we’ve seen down here at the house, but they haven’t hit that one inch threshold for the snow report. Although still rather cold this weekend, temperatures have definitely moderated somewhat from the beginning of the week… when high temperatures actually remained below zero in many locations. Yesterday we topped out around 15 F down here at the house (495’), and the afternoon temperature was sitting around 4 F up in the Bolton Valley Village (2,100’). Today we actually got up around 20 F at the house, and when I arrived at the Village in the mid afternoon, the temperature was a reasonable 12 F. The arctic air is definitely waning. Although I wasn’t planning on doing too much skiing this weekend with the combination of air temperature and minimal new snow, I at least wanted to get out one day for a tour. I almost got one in yesterday, but ran out of time since we were having James and the kids over for the evening. However, E and Claire cancelled our BJAMS ski program at Stowe today due to the forecast temperatures, so it gave me the opportunity to get in an afternoon tour. I think today actually worked out to be the better ski day of the weekend, since it was almost 10 F warmer up on the mountain, and we had sunny skies in contrast to a bit of gray yesterday afternoon. 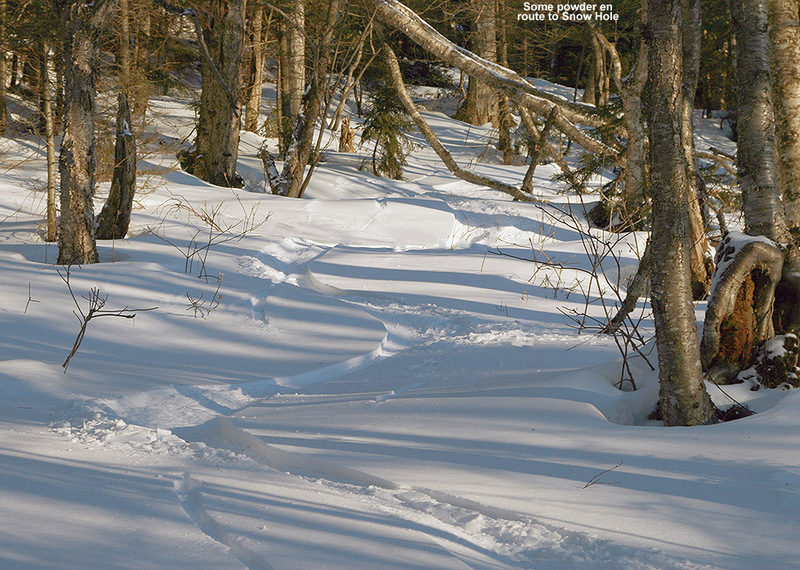 Last weekend’s outing on the backcountry network was fun, since the powder was decent, but also fruitful in that I discovered a nice new glade in an area I hadn’t previously visited. That discovery really wasn’t planned, but since it worked out well I figured I’d go with a similar theme today; my goal was to check out a descent off Heavenly Highway in the Moose Glen area. It’s an area that E and the boys and I have wanted to explore for a while. Since the boys were a bit under the weather and they weren’t going to head out in the cold temperatures, it was another solo outing for me. I find these solo outings work well for reconnaissance though, because I can move quickly and efficiently and explore a lot of terrain relative to when we’ve got the boys along. the powder, my feet felt really quick. 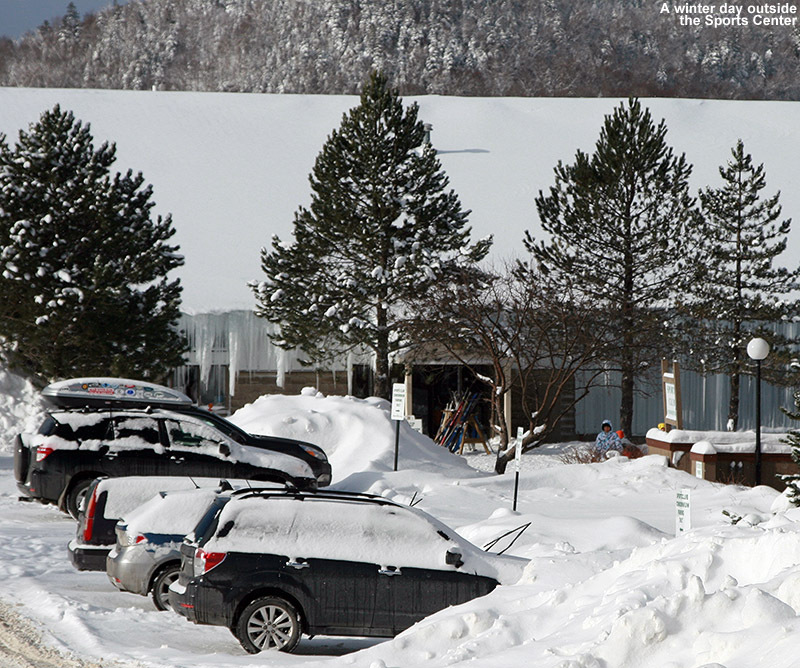 Once again, despite the chilly temperatures and dearth of fresh snow, the main parking lots up in the Village were pretty full, so the resort was getting a lot of visitors. On piste conditions are actually pretty good based on what I’ve seen though, as the arctic air appears to be preserving packed powder surfaces very nicely. I’ve been sort of down on the arctic air that’s been hanging around because it doesn’t bring fresh powder for skiing, but boy does it do a heck of a job on snow preservation. Even though new snow has been minimal in the past week, I could tell that the quality of the snow on the ground had improved as soon as I began my ascent today. 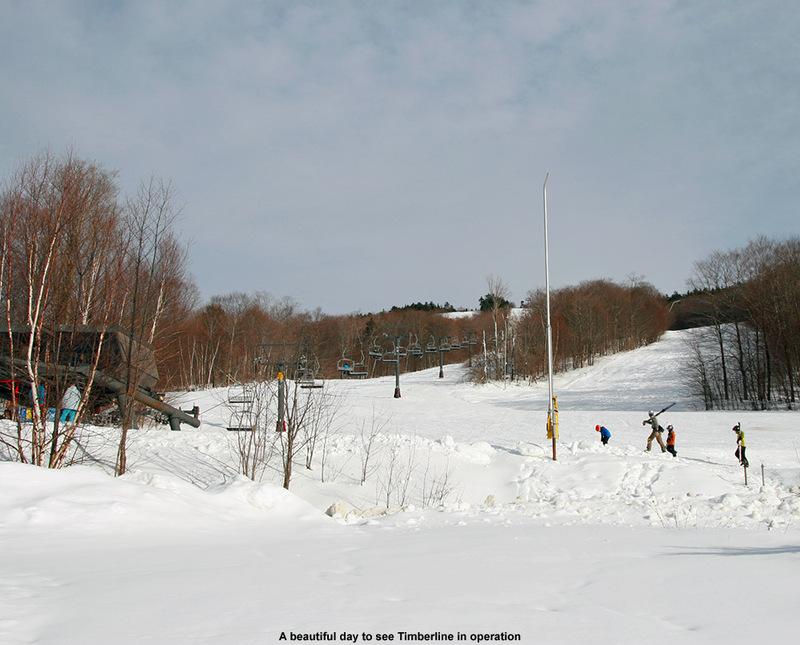 I saw a bunch of Telemark skiers working on turns on the Telemark Practice Slope, and even though that was a tracked area and they were often on the subsurface below the powder, the turns were very quiet. As I probed around and checked depths during my trip up the Bryant Trail, I could tell first hand that the subsurface had improved since last weekend. Presumably that ultra dry arctic air has been working on it, because it was even more crumbly and Styrofoam-like than last weekend. 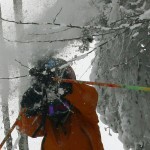 The conditions also seemed to be bolstered by additional powder. Whereas last weekend I found 3 to 4 inches at the 2,100’ level and 6” up at 2,700 at the Bryant Cabin, today I found roughly 5 inches at the base elevations and 7 to 8 inches at the cabin. It was surprising to think that the snow was holding pat after such a dry week, let alone improving. My ascent went smoothly, and I saw a few other groups of skiers here and there having fun in the good snow. After reaching the Bryant Cabin, I continued on up to Heavenly Highway, and once I got up to around the 3,000’ elevation I could really see just how well preserved things were at those elevations. 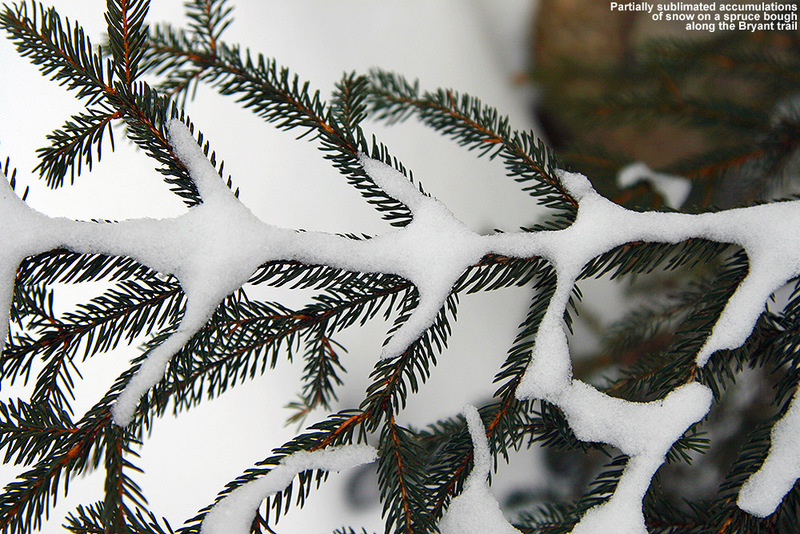 In protected areas, the evergreens were still coated in white like snow had just fallen. 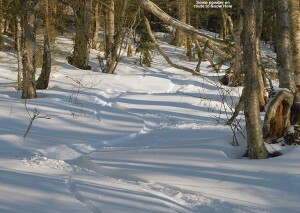 I finally switched to descent mode in the Moose Glen area, where below me sat a nice open, untracked line powder line. The pitch looked perfect for the 6 to 8 inches of medium-weight arctic fluff that it held, and I could see the exact line I wanted to take. As I sat there contemplating those first turns, there was an almost tangible excitement in seeing if the snow was going to deliver. 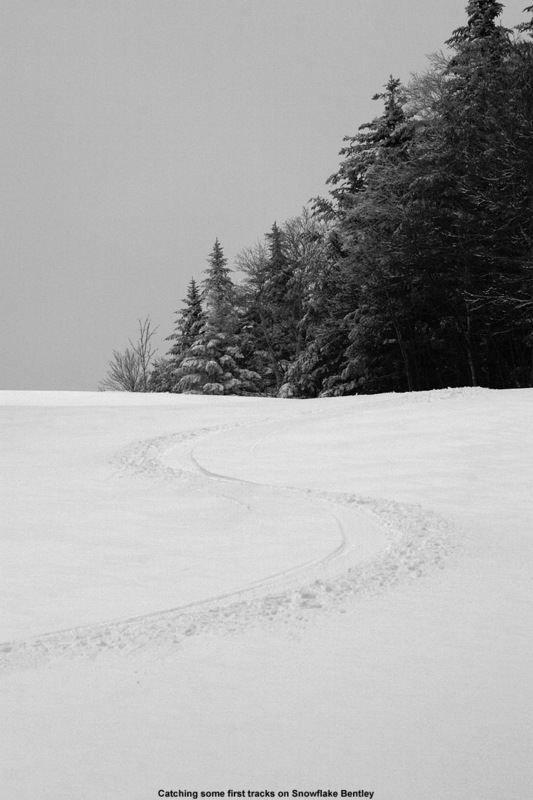 As good as the snow can seem on the ascent, making those turns is really where the rubber meets the road. I dropped in and the turns were smooth and effortless; there was still the occasional touch on the subsurface, but indeed the conditions had taken quite a leap since last weekend. There were a couple old tracks from previous skiers to give me an idea of where to go on the descent, but I also let the lay of the land dictate the route. A number of clear areas offering nice turns, but I could tell that many more shots would be available if the snowpack was bumped up a foot or two. After some consolidation and this dry January spell, snowpack depth at the Mt. 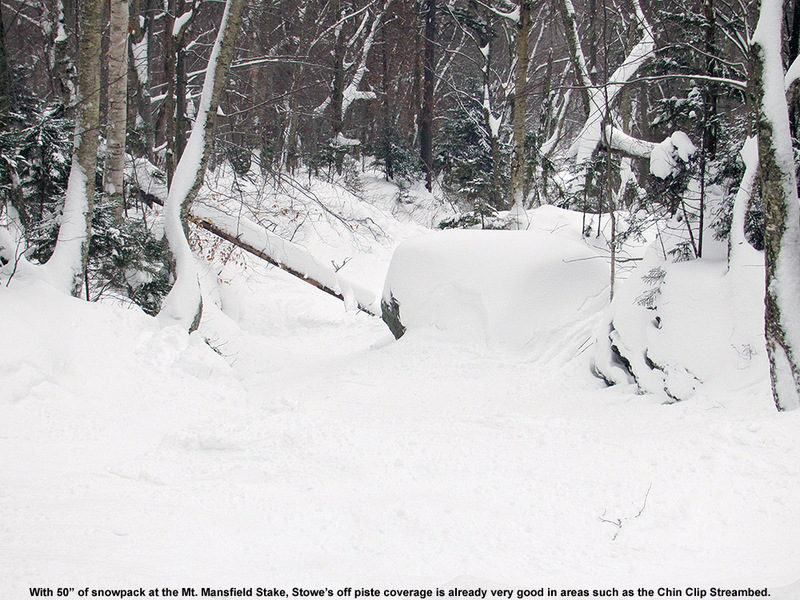 Mansfield Stake is about a foot below average, so typically some of those areas with brush would be covered by now. Hopefully we can do some catching up on snow depth in the next couple of months. 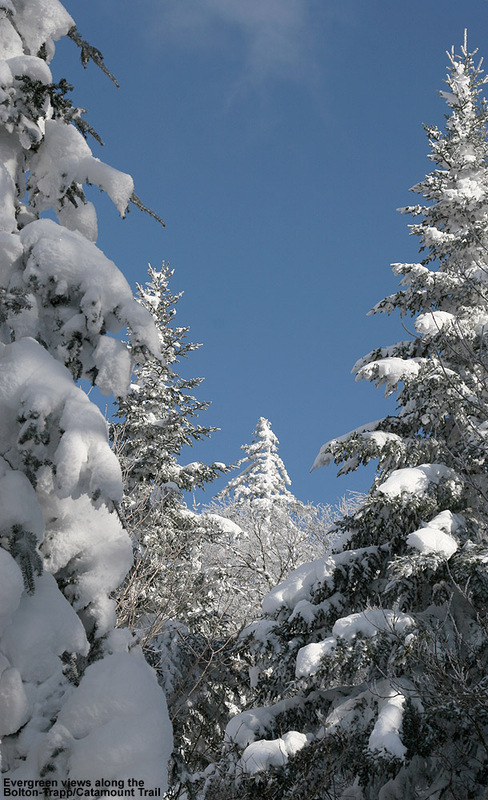 I continued downward in a general southerly direction and entered an area of flat terrain among evergreens. I could tell that it was a bit of a shelf with land sloping off to the south. 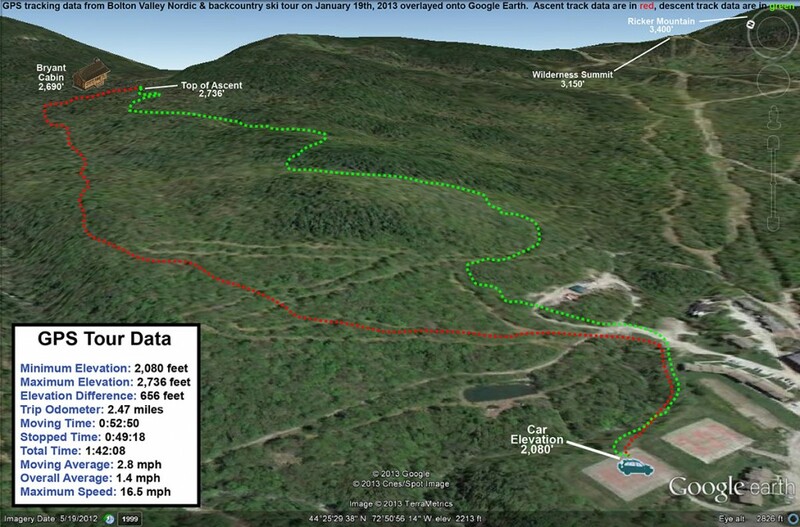 There was a clearly cut route that entered the area, but the ski tracks that had led me there disappeared. After a few minutes of poking around, I was happy to find that my instincts had led me in the right direction. 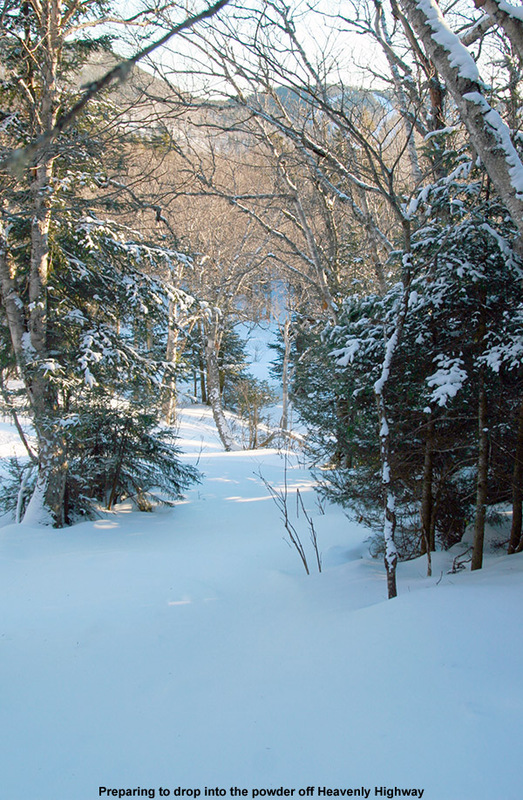 There was a nicely made glade dropping down the initial steep slope, and then in mellowed out into a large, sparsely treed area with lines everywhere. 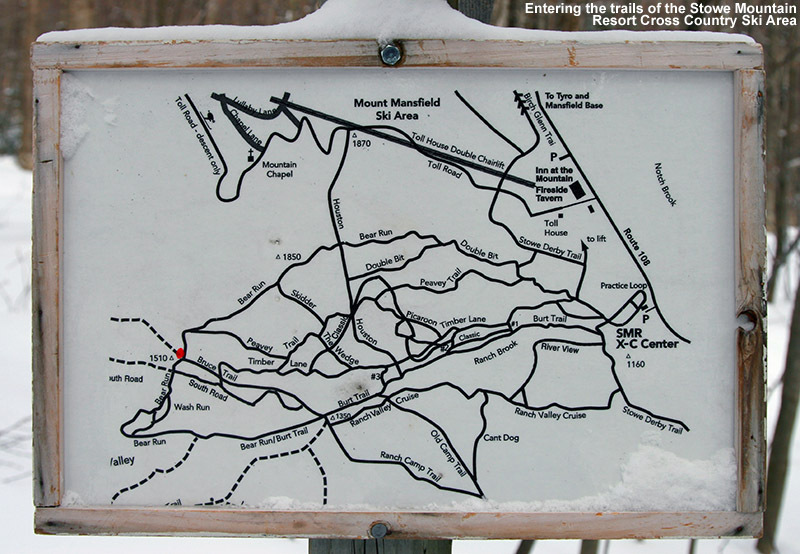 I enjoyed a lot of good turns in there, and I eventually found that it had led me right down in Snow Hole, which without the Wilderness Lift running, didn’t have many ski tracks. 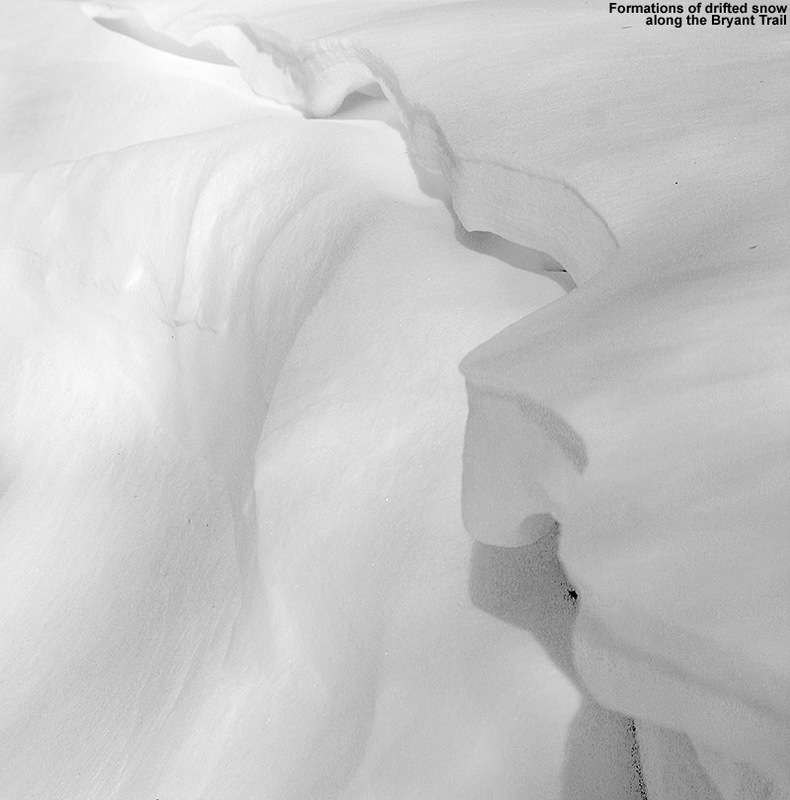 I was really appreciating the consistency of the snow in Snow Hole – the powder was just perfect for the pitch; it was dry, but somewhere just on the dry side of medium in density, and the floatation was great. When I came to the fork indicating the route over to the Wilderness Lift, I opted to check out the right option instead, and quickly found myself on Gardiner’s Lane. I was really liking the overall setup of this descent, gaining that extra elevation above the Bryant Cabin had already given it that extra boost of vertical, and I knew I still had some good turns to go. On World Cup I headed past the glades adjacent to the Telemark Practice Slope, since I could see that they had seen a number of skiers, and continued on until I got to some additional untracked lines. 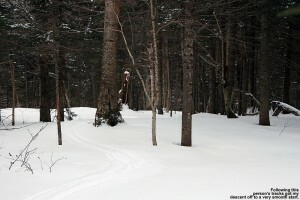 The woods are pretty open there, so there was no need for a specific glade to get some really nice turns. As I slid through that last run in the powder, my feet felt really quick. I guess that’s the best way to describe it; the pitch of the slope, the depth of the powder, and the length and width of my skis all just came together to make everything work for Telemark turns. I’d say that was really just the pinnacle in terms of that feeling, but all day today I felt good on the AMPerages. After the way they’d felt slow at times last weekend when I hit the Bruce Trail, I was tempted to switch to my narrower-waisted RT-86s today for a faster feel with a potentially firmer base. In the end I decided that I wanted the float of the AMPerages, and I’m glad I went that route. Whether it was that improvement in the powder, the subsurface, the snow density, or just the lines I hit today, they were the tool of choice. It was getting close to 5:00 P.M. before I was done with my tour, and now that we’re over a month past the solstice, I’m definitely noticing (and thankful for) that longer light. We’ve also got some warmer temperatures coming in the next few days, with a dramatic change in the weather pattern this week. A storm is coming in tomorrow that is forecast to deliver a modest 2-4” type of snowfall, but that is going to feel like a lot after only arctic dustings over the past week or so. We’re also expected to go above freezing with the next round of the storm as it cuts to the west, but hopefully we’ll get some additional snow on the back side. We could be into a more active pattern going into next weekend, which would be nice to build the snowpack after these January doldrums. With that said, I’ve certainly got a new found respect for what these arctic weather conditions can do for the snowpack, so if we do get another round of that weather, the skiing could be good as long as we can get at least some snow to go with it. Some of the Northern Vermont ski areas have picked up close to (or in the case of Jay Peak, substantially more than) a foot of snow in the past seven days, and while that’s actually a fairly modest pace for snow accrual in the mountains this time of year, it’s helped to get surfaces back to packed powder since they hardened up last week. The snow has generally been dry and fluffy, so even with all that accumulation it hasn’t been a thorough resurfacing for all slopes. However, my explorations Saturday on the Bolton Valley Backcountry Network revealed that the powder is building and there are some nice turns to be had. Temperatures were expected to be in the single digits in the highest elevations today, so it seemed like a good opportunity for some sidecountry exploration instead of riding lifts. And, since Claire and I have been talking about bringing our Stowe ski group for a trip on the Bruce Trail one of these days, this seemed like an excellent opportunity for some reconnaissance. 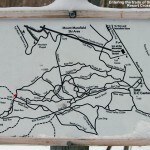 There’s no doubt that everyone in the group is ready for the skiing on the Bruce, but I still wanted to familiarize myself with the route to ensure that the trip would go smoothly with all the boys in tow. Temperatures hovered right around 10 F all the way to the base of the resort, and there was sun and no wind, so it wasn’t feeling too frigid at the point. The resort had snow guns going on various trails, no doubt taking advantage of the temperatures to bolster base depths that were probably brought down a bit by the warmth earlier in the month. I rode the Fourrunner Quad with a guy who had already been out for some runs, and he said the conditions were quite good. Listening to the turns of the skiers below us, it did sound pretty quiet. I could see the occasional icy spot, but the surface seemed to be mostly packed powder just as the snow report had indicated. The snow over the past week has definitely been having an effect in terms of softening up surfaces. From the quad summit I headed over to the top of the Bruce Trail – a few tracks indicated that some skiers had already skied it today, but I dropped in via an alternate entrance to get an untracked line. The line was pretty steep and I was definitely touching down on the subsurface, but I could tell that I’d be able to get in some good powder turns on some lower angle terrain. The top part of the Bruce wasn’t really all that inspiring today – it’s pretty steep, a lot of pitches face southward, and it’s narrower than I’d thought it would be. I’d say it’s only 10 to 12 feet wide on average in the upper sections, which means that in reality it’s going to be tracked out and packed down after just a few skiers hit it. 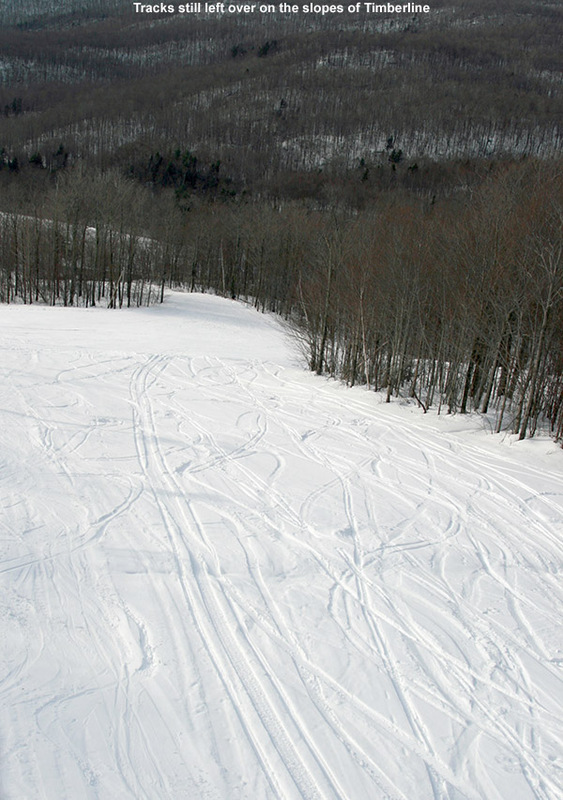 With its somewhat southern aspect making for spots of poor coverage here and there, it skied even narrower today. The snow was generally skier packed, so my fat Telemark skis were indeed feeling slow edge to edge, and I had to throw in a good number of alpine turns to fit in some of those small spaces dictated by the trail width and coverage. While I’m sure the steeper top sections of the Bruce are great with a good dump of snow, the skiing today was far superior once I got down out of the evergreens and into the hardwood forest. The trail is notably wider in that area, and there are a lot more glade options for venturing off the sides of the main route. In general, I found 6 to 7 inches of powder down to the 2,000’ elevation, and at some point below there it dropped down more toward the 5-inch range. 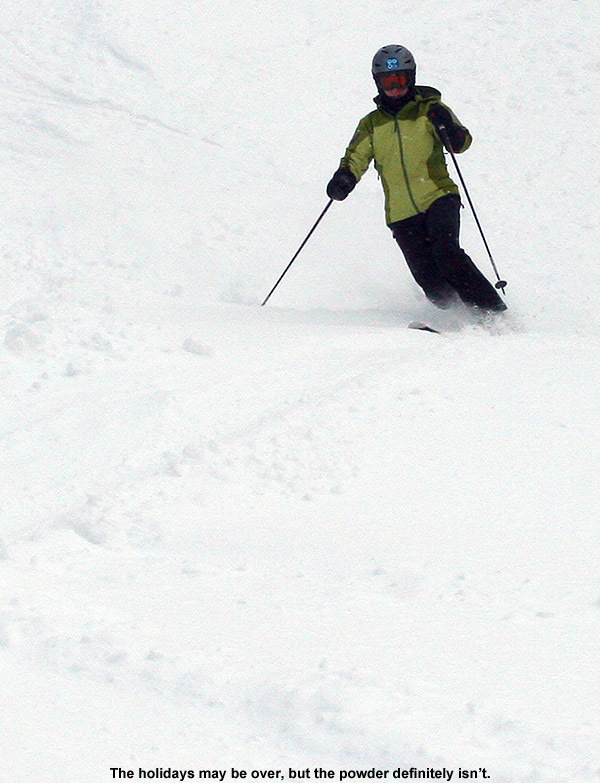 All those depths were definitely enough for some nice powder turns on moderate angle terrain though. 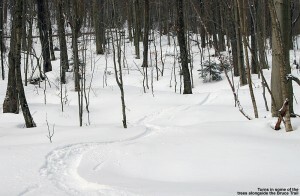 With the narrow nature of the Bruce Trail in the top sections, it’s really not a trail that’s going to offer up much in terms of fresh powder, so those looking for a sidecountry experience with real untracked snow would probably be best served by using the Bruce as a jumping off point for explorations of the Ranch Valley. The snowpack isn’t even especially deep right now (right around the 40” mark), but I could see a multitude of ski options all around during my descent. I noted a couple of potential areas for exploration up in the evergreen areas, but choices really exploded once down in the hardwoods. It would be easy to make a day of it out there, or, ski the resort in the morning and then tour out in the Ranch Valley in the afternoon and finish off the day by skiing out to Route 108. 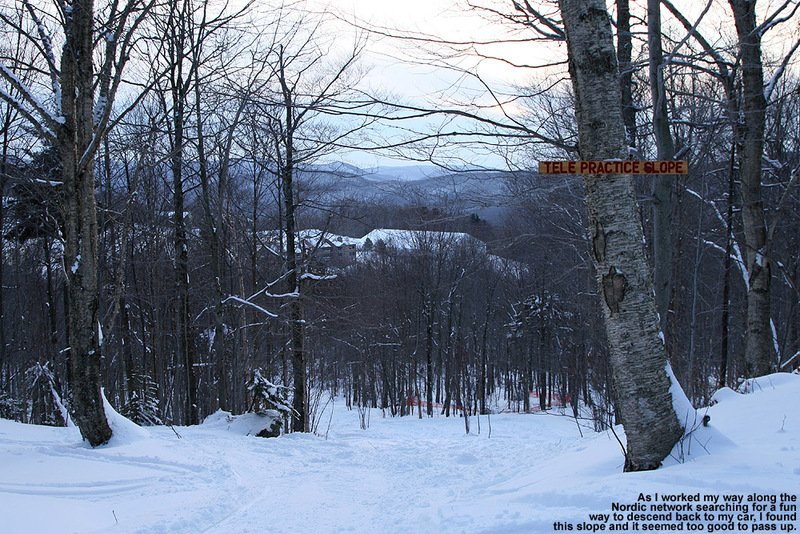 At around the 1,500’ elevation, I entered the trails of the Stowe Mountain Resort Cross Country Ski Center. This is the part I’d been concerned about in terms of making the correct choices to get out to Route 108 and the Matterhorn. It turns out that it’s much easier than I’d thought; you simply stay on the Bruce, and Burt Trails, following the signs that say “Ski Lift”. 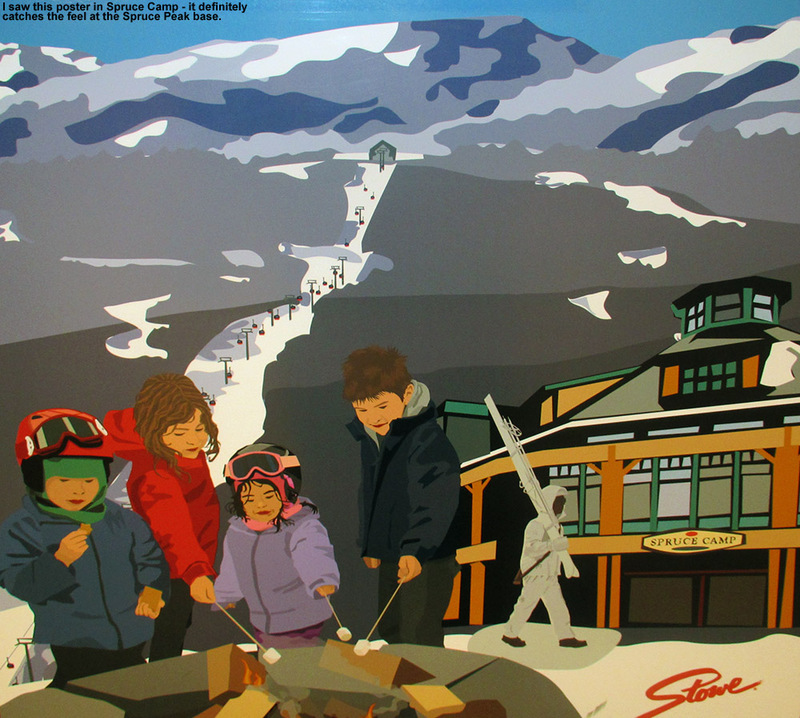 Even though you may not be planning to head back to the Toll House Lift, those “Ski Lift” signs are the way to go. Eventually you’ll get to a junction where following the “Ski Lift” route is a very obvious (and somewhat arduous looking) uphill, so you won’t want to go that way. 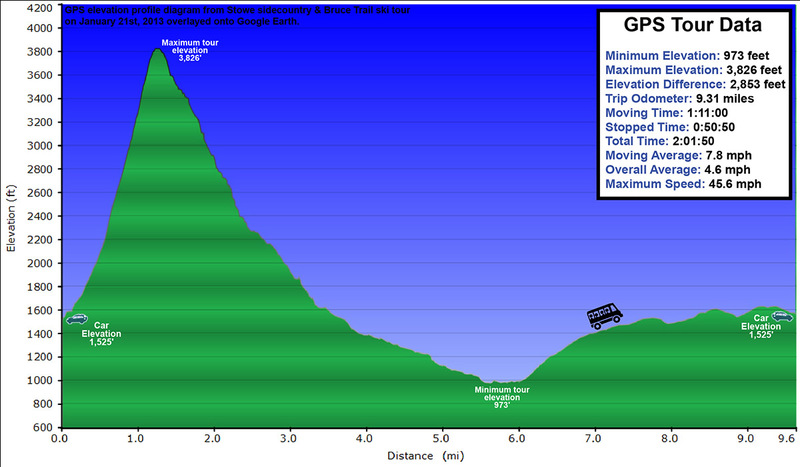 By that point there are signs that indicate “Route 108”, and those will get you right out to the Matterhorn area. At every intersection you essentially go straight through, so in a worst case scenario, go with that. 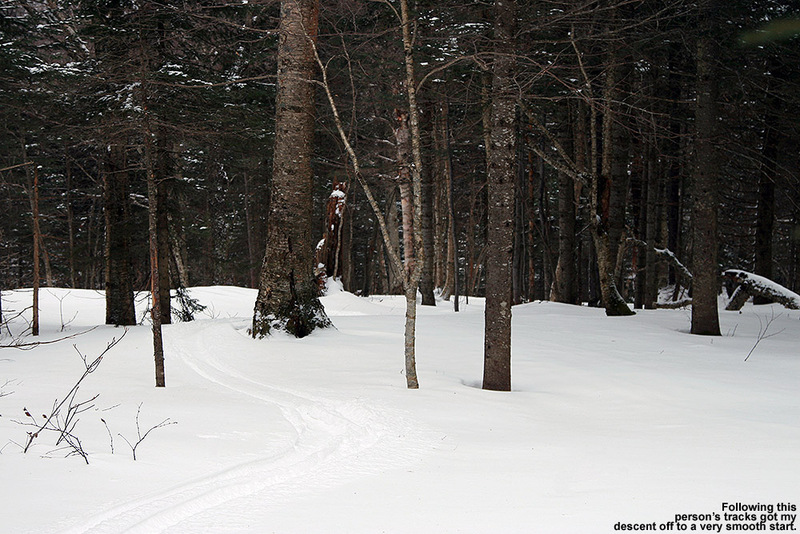 The trek through Stowe’s Nordic trails, and a small portion of the trails that belong to the Trapp Family Lodge Cross Country Ski Center, is slightly downhill, but there’s plenty of poling and skating to be done. I was happy to have my Telemark gear, even if I looked funny with my skis being three times the width of the other Nordic skiers ambling around on the trails. I generally took it slow and enjoyed the scenery, which included some marvelous views of the Ranch Brook. The brook had that winter look with some flowing water, but also lots of ice, and snow pillows covering the rocks. 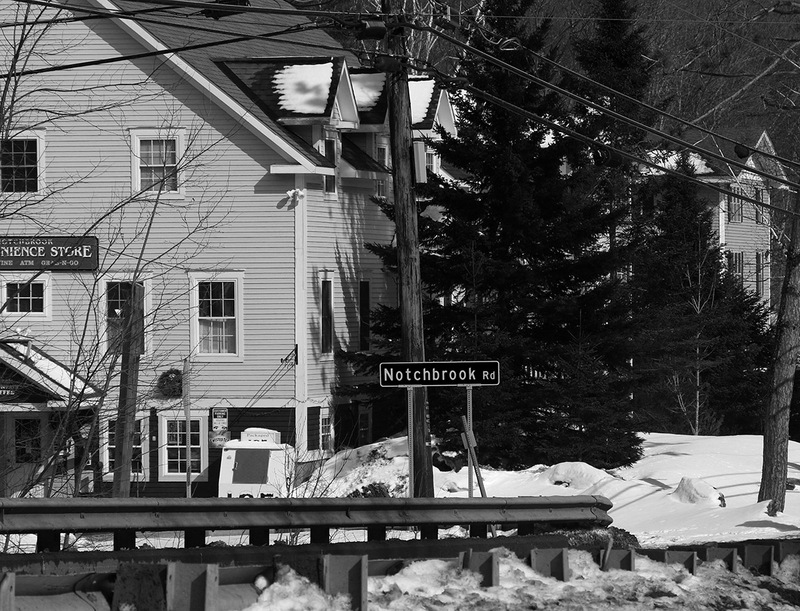 The final leg of the descent on Ranch Brook Road brings your right out on the “Ski Inn” driveway, next door to the Matterhorn, and across the street from The Notchbrook Convenience Store. I had time before the next uphill Mountain Road Shuttle arrived, so I stopped into the Matterhorn to get some sushi… only to discover that they don’t have sushi on Mondays. Clearly I’m going to have to hit the Bruce again with the boys on a different day so that we can finish that part of the adventure. So instead, I popped across the street to the store and got a snack before catching the shuttle back up to my car in the Mt. Mansfield lot. One thing I should note about the shuttle – the ski slots on the outside are still fairly old school, so if you’ve got fat and/or twin tip skis, you might have to bring them on the bus with you. Apparently that happens a lot, because the driver immediately knew what my issue was when I inquired. Missing out on the sushi, I did stop off at Harvest Market for a couple of samosas on the way home, and that definitely filled the void. 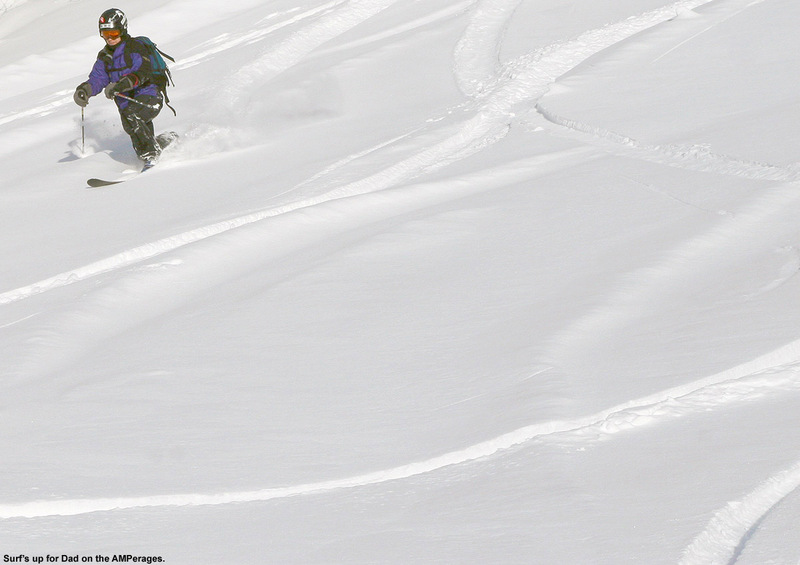 So, today’s outing offered up some good turns in the powder, and was certainly a successful reconnaissance. The route down to the Matterhorn is easy, and I can tell that the biggest hurdle is going to be getting the boys through the flatter terrain at the end of the run. If that’s the toughest part we have to deal with though, it should be a lot of fun. Weather-wise, the day turned out much warmer than the forecast seemed to suggest – it was 20 F once I was back down in the valley, and before I’d realized that, I couldn’t figure out why it felt so comfortable. The sunny skies from earlier in the day had clouded over ahead of another small snowfall event that’s supposed to hit us tonight into tomorrow – these are the sorts of storms we’ve got for now until something bigger comes along, but at least we’re getting something. 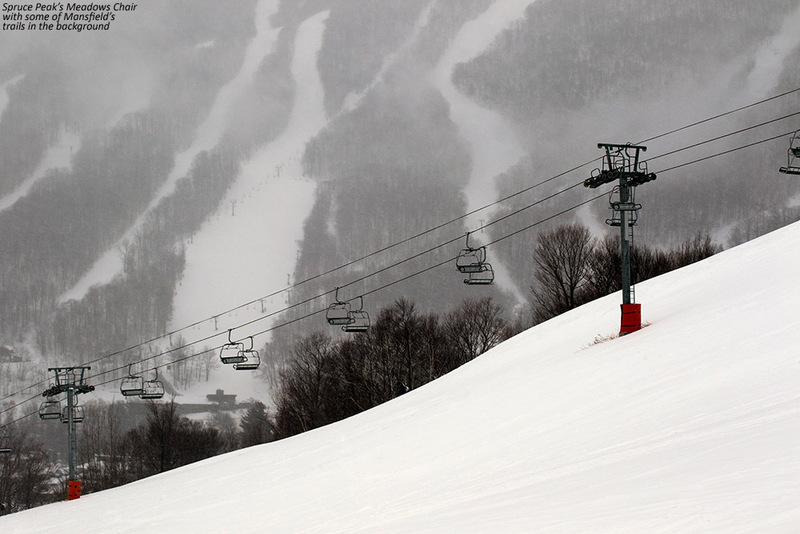 It was a lot of fun skiing in the soft snow and warm temperatures last weekend, but winter is definitely back now. Temperatures dropped down closer to seasonable levels at the beginning of the week, and then the bottom fell out toward the end of the week as we dropped below zero F Thursday night with an arctic frontal passage. Fortunately, we’ve also had some modest shots of snow to start freshening the snowpack, and temperatures were back up to around 30 F in the mountains today, so it did seem like a good opportunity to get out for some turns and exercise. 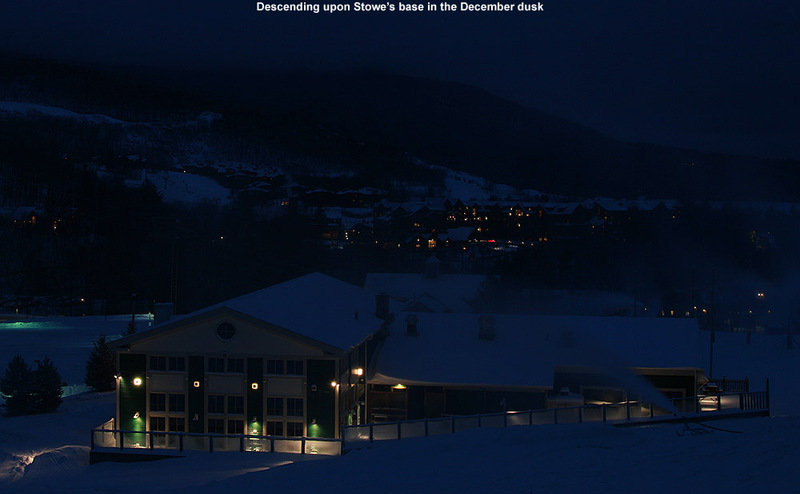 Stowe is reporting 8” of snow since Wednesday, and the skiing looks great based on the pictures that Powderfreak posted in the ski thread and the Northern New England thread at the American Weather Forum today. Bolton Valley is also reporting 5” of new snow during the period. Although I’m thinking of waiting until we hit roughly the one foot mark before checking out the lift served terrain, it did seem like we’d seen enough new snow in the past few days to provide some decent backcountry turns. 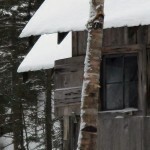 With all that in mind, I decided to hit the mountain for a quick tour up to the Bryant Cabin and back through whatever terrain seemed fitting for the conditions. 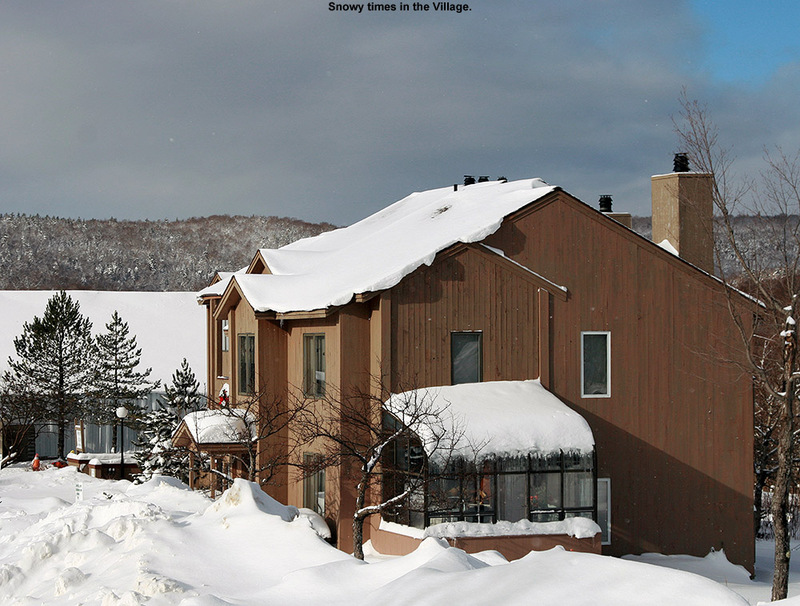 We’d reached the mid 30s F down at the house (495’) when I headed out around 2:00 P.M., but up in the Village at 2,100’ it was just 31 F. There certainly hasn’t been enough snowfall yet to really resurface the slopes and get the on piste conditions back to normal, so I couldn’t believe how the Village parking lots were virtually full. I wasn’t even able to get a parking spot in the upper tennis court lot like I usually do because it was full, but the lower tennis court lot had a decent number of spaces, and I was still able to park trailside along Broadway. The resort was hopping though, so I guess the holiday weekend and the comfortable weather are enough to make people really want to get out there. Overall that’s great for the resort of course. In terms of unconsolidated snow above the old base, I found 3 to 4 inches of fluff down at the Village level, and that gradually increased to the 4 to 6 inch range by the time I got up to the Bryant Cabin at around 2,700’. Coverage on the Bryant Trail was generally fine, although a couple of the stream crossings had only recently filled back in after presumably being blown out a bit with running water during the warm spell. Traffic out in the Bryant area was pretty light once I was up above the Nordic trails – I saw a couple of skiers descending and a couple groups coming down on snowshoes. The air was generally calm, although you could occasionally hear some gentle gusts of wind up in the peaks. We’ve got another system and arctic frontal boundary coming through tomorrow, so there was that feeling of being between systems. There was nobody in the Bryant Cabin area when I arrived there, and it was very quiet as I made my way past and stopped at the top of Gardiner’s Lane. I could see some of the glades above me, and the look of the powder up there was very appealing, but I could tell by the tracks of a couple of other skiers up there that the new snow wasn’t quite deep enough to really make the turns bottomless. 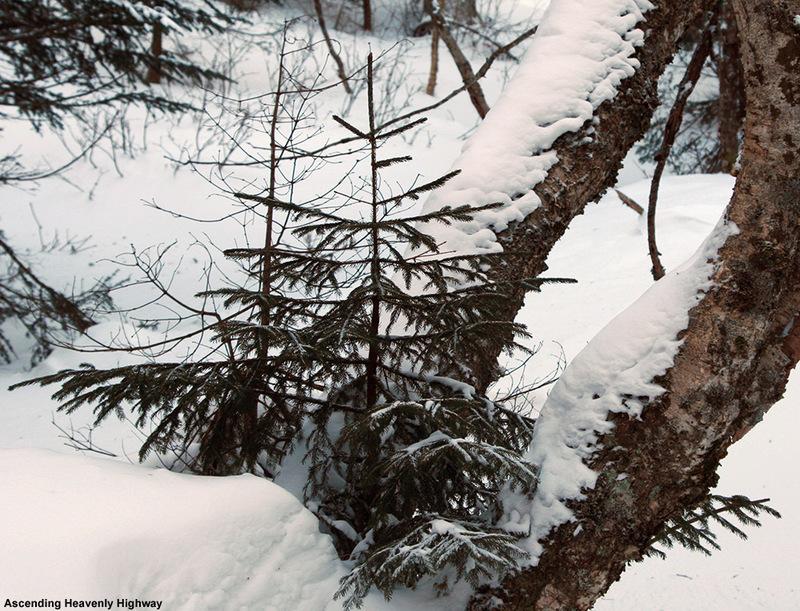 As I was stripping off my skins, I heard a little noise coming from above me in the Birch Loop direction, and soon another backcountry skier passed by and headed down Gardiner’s Lane. I’m not sure what he’d been skiing up above, but he probably had a similar plan to mine for the terrain below – there are a lot of nice mellow options off Gardiner’s Lane that would work really well with the conditions. Conditions on Gardiner’s Lane were packed, and a little bumpy in spots. At the junction with North Slope, I headed up a bit to catch a nice mellow line that I knew, and I’m glad that I did. I could see that another skier had taken in before me, and the tracks left behind suggested some nice turns. 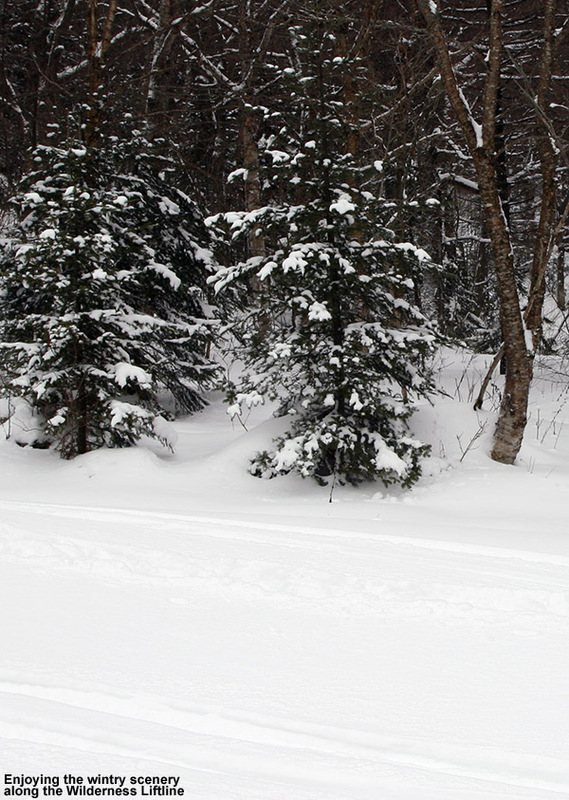 Indeed the turns in the powder were silky, especially when aided by the width of my AMPerages, and it was nice to feel that float again. Back on Gardiner’s Lane, I had a feeling that I was in the zone of another glade I knew, and figuring that Gardiner’s Lane itself would have seen a fair share of traffic, I decided to head on that lesser used route. Only one other skier had passed through there, and the snow was good, but the pitch was too steep to avoid contacting the base snow. Below there I followed a set of tracks to an area I’d never been, and found a nice long glade that brought me all the way back down to World Cup. It’s got to be one of the longest glades I’ve seen out there. 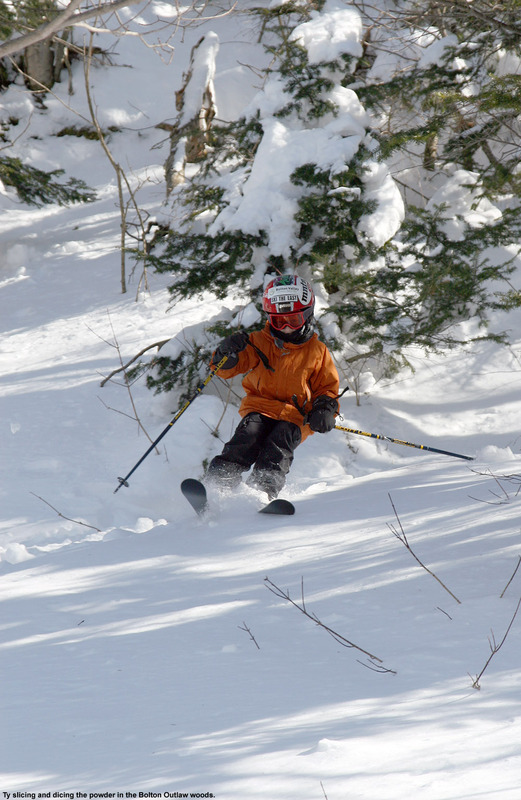 I’m not sure how new it is in the grand scheme of the backcountry network, but it’s new to me; I can’t wait to show it to E and the boys – especially with deeper powder. Someone did some nice work in there. The glade starts off with some mellow terrain that was great for today’s conditions, and then it steepens out to more of an intermediate pitch. I was even able to finish off with a run on the Telemark Practice Slope, which did have some irregularities in the subsurface snow due to previous skier traffic, but still delivered some nice turns – even a few in which I was able to stay floating in the powder. Overall I’d say that that part of the run in the new glade was a good description of the general conditions out there – you can get some bottomless turns (especially with the help of fat powder boards) on the mellower green-style terrain, but on intermediate pitches and above you’re going to be touching bottom a lot. It was definitely worth a tour out there today though, and if we get a few more inches as the next system passes through tomorrow, it’s going to be even better. The clouds put on quite a show today throughout the mountains. 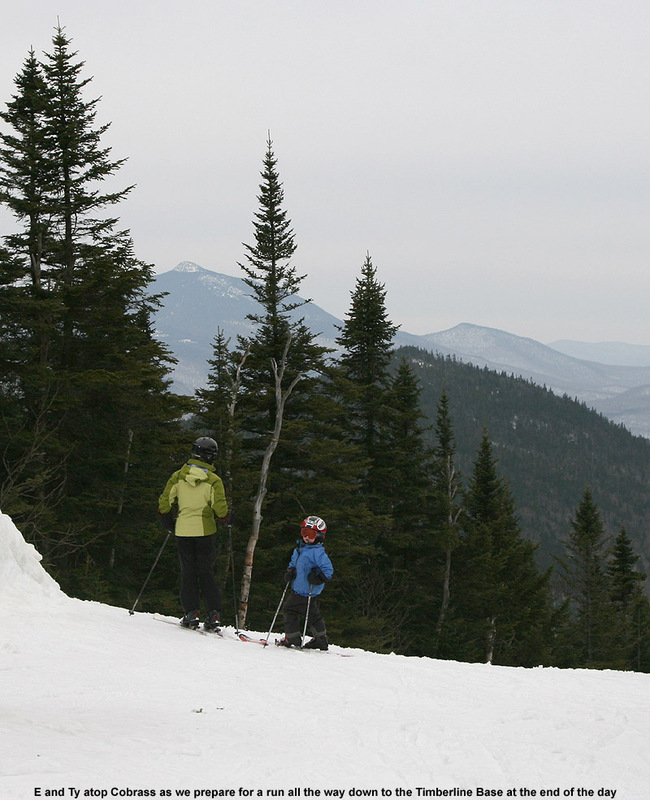 With a generally cloudy forecast, I wasn’t sure if today’s skiing at Stowe was going to match up to the quality we experienced yesterday at Bolton, but boy did Mt. Mansfield deliver. Temperatures did get down to the freezing point overnight, but the morning clouds in the valley were an undercast that meant sunny skies in the mountains. Any snow that might have cooled down and tightened up was certainly soft by the time we arrived around midday. There was some exciting weather out there as well. 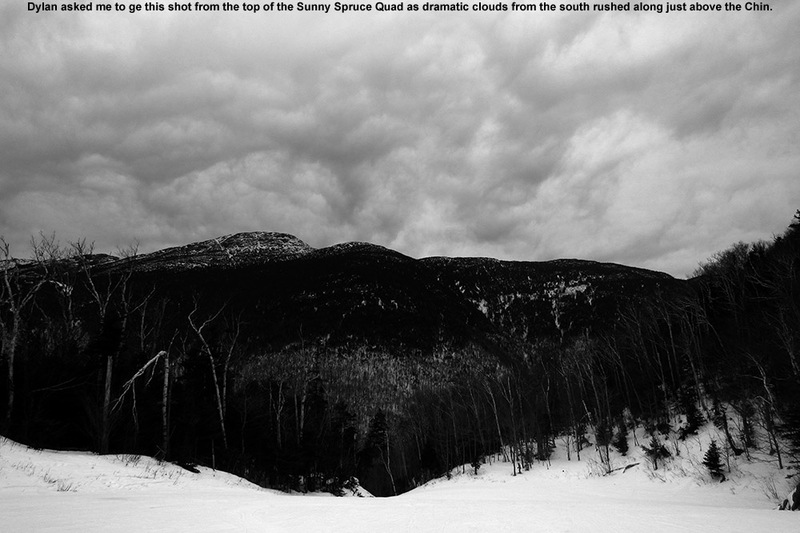 Higher clouds had built in from the south, and screaming winds in the higher elevations of the atmosphere had them cruising along at impressive speeds not to far above the summits. Temperatures were schizophrenic too, with hot and cold pockets all over the place. On my first run of the day on the Sunny Spruce Quad, after we’d risen about 1,000’ vertical or so, we suddenly got to a warm layer of the atmosphere – the temperature felt like it changed 10 F instantaneously. We kicked off the day on Spruce Peak, and Luke had a little trouble with the RFID on his season’s pass that required the lift operator to call in some technical help. That gave us time to meet up with Claire though, once she’d taken care of her duties and gotten the program coordinators their passes. Conditions on Spruce Peak were generally nice, but there were certainly some bare spots opening up on natural snow terrain since it’s generally south-facing. Everything was soft, with the best surfaces being those that had seen various combinations grooming, skier traffic, or manmade snow. 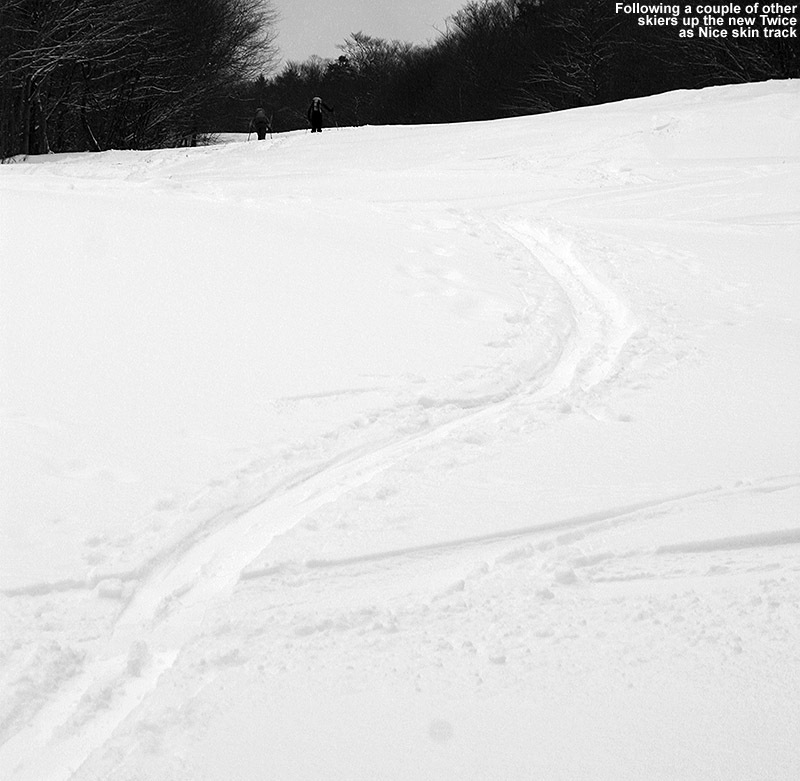 Natural snow terrain that hadn’t seen any packing was skiable, but typically mushy or sticky. I found turns down West Slope this afternoon particularly invigorating, as you could lay your skis over as far as you wanted on that steep pitch and have that snow just peel away as you carved it up. After a few runs on Spruce, we took a quick pit stop at Spruce Camp where Claire and Luke gabbed some bagels that they hadn’t had a chance to eat earlier, folks got drinks if they needed them, and then we shifted over to Mt. Mansfield. 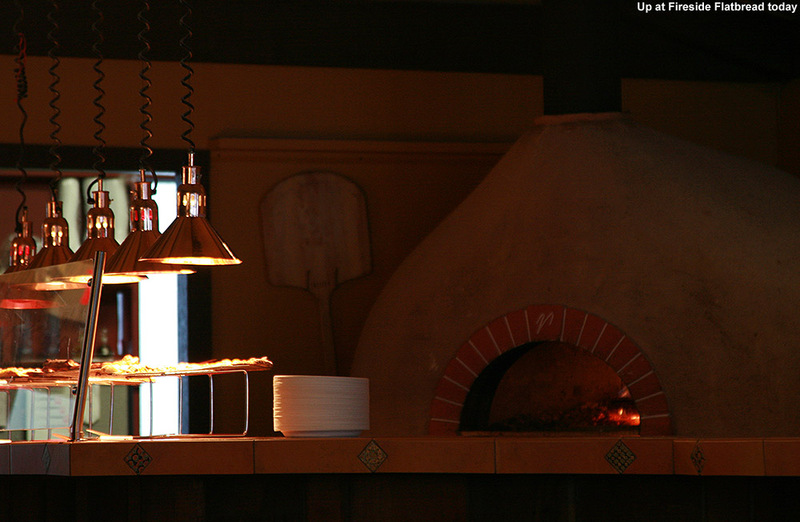 With back to back gondola rides to get up to the Cliff House, there was plenty of time to take in snacks, but since not everyone had food, we decided that we’d also go for some food at the Octagon. From the top of the Gondola we headed down toward the Fourrunner Quad via Cliff Trail, and with all natural snow, there were some sticky spots, especially where traffic was lowest. You could really feel the difference in the snow surfaces when we arrived at Nosedive though, since it has a good amount of manmade snow and sees a lot more traffic; there were no issues with sticky snow there. At the Octagon we got some food, hung out for while, and everyone had a good recharge. 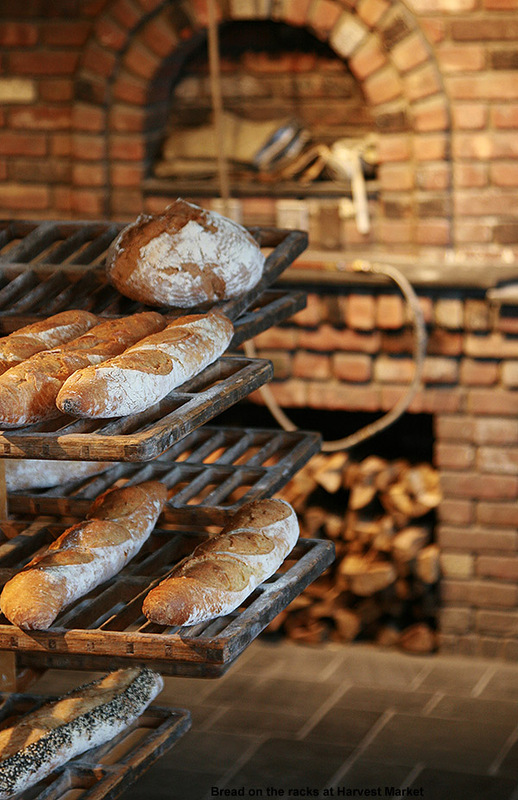 As it turned out, we were all going to need that recharge, because we were going to work ourselves hard for the rest of the afternoon. Luke had originally requested a trip to Nosedive Bypass, since it’s one of the mountain’s areas that he’d yet to ski, but we were unsure of how much traffic it had seen, and how easy the skiing would be. 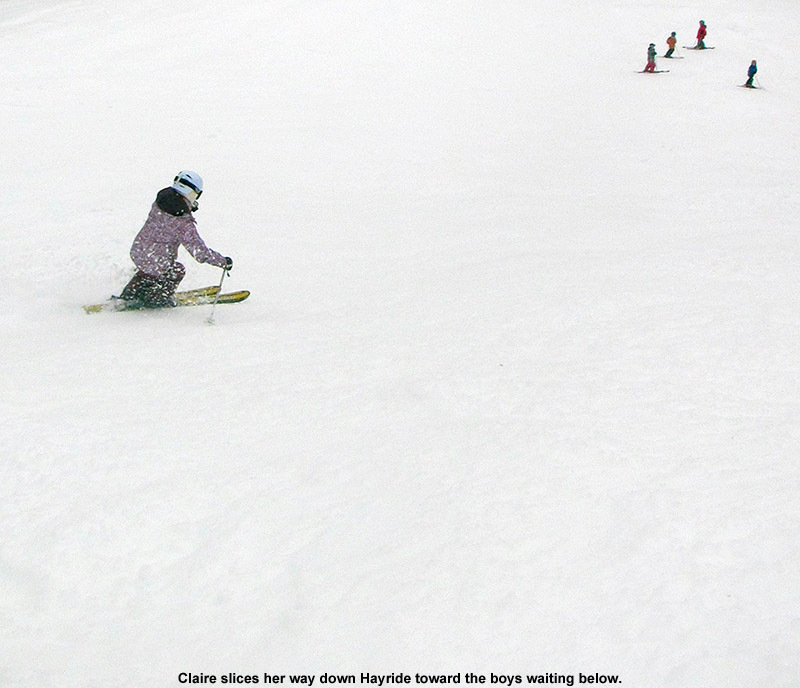 Instead, Claire and I decided that it would be a perfect time for the boys to work on their bump skiing. The snow was just so good on that type of terrain that we didn’t want to pass up the chance, so we headed to the top of Hayride and Centerline. 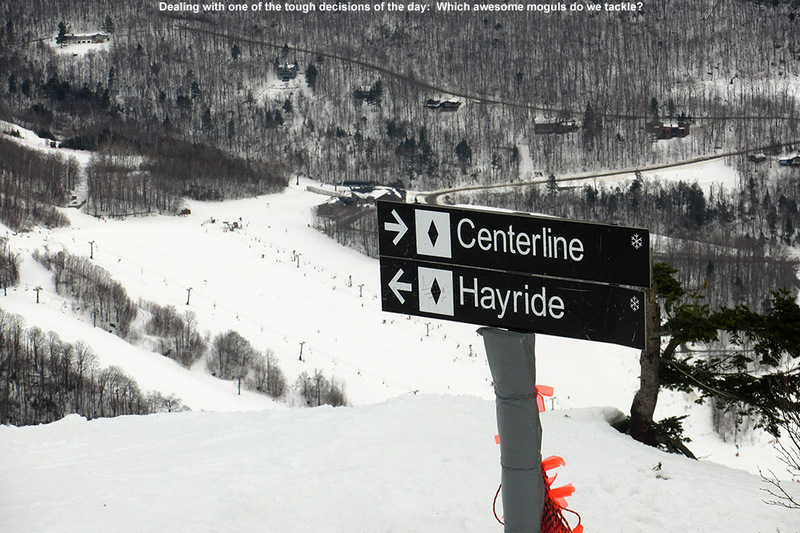 We could see that both were loaded with tons of soft, fantastic looking bump lines, so it was a difficult decision, but we ultimately went with Hayride. 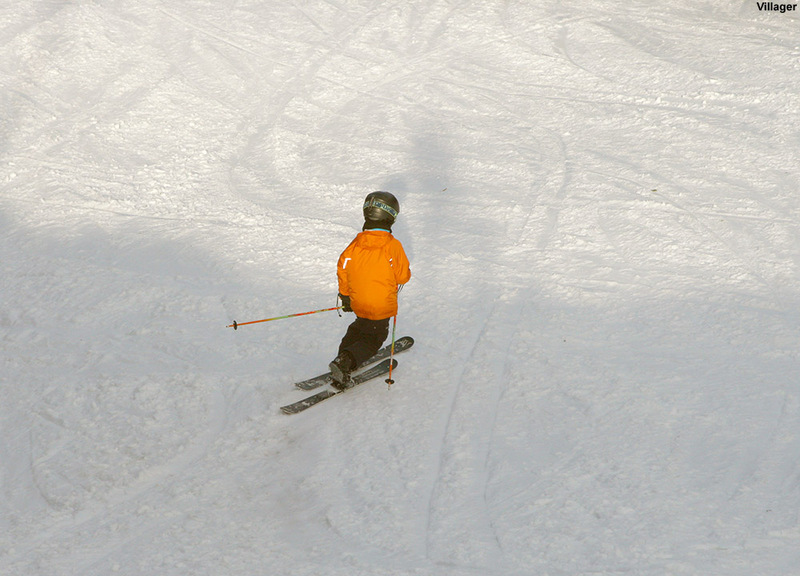 It turned out to be a good choice because there were also those extra steep pitches that let the boys work on steep skiing technique. 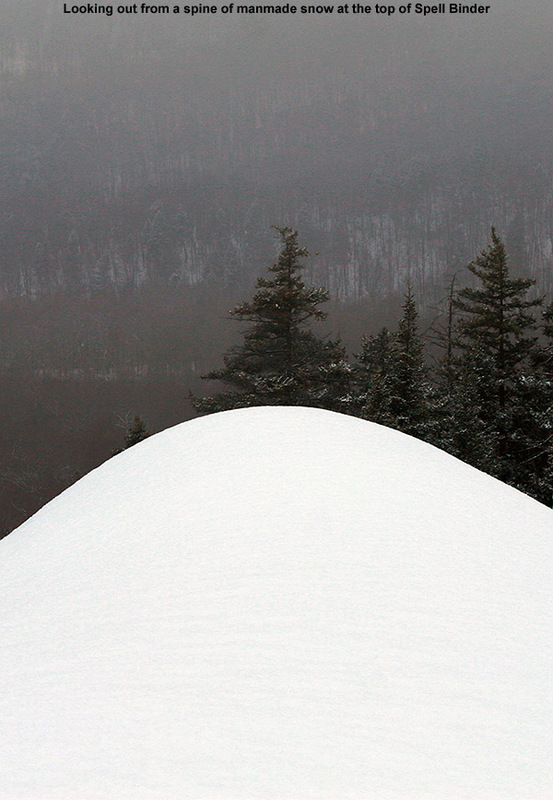 The bumps were excellent, and the snow quality was fantastic even on the steepest pitches. You could attack anything, as steep as you wanted, and that snow would just peel away beautifully and let you hold those turns. Although the boys were all ripping up the terrain, and it was hard to nitpick on instruction, I could see that they needed some pole work. 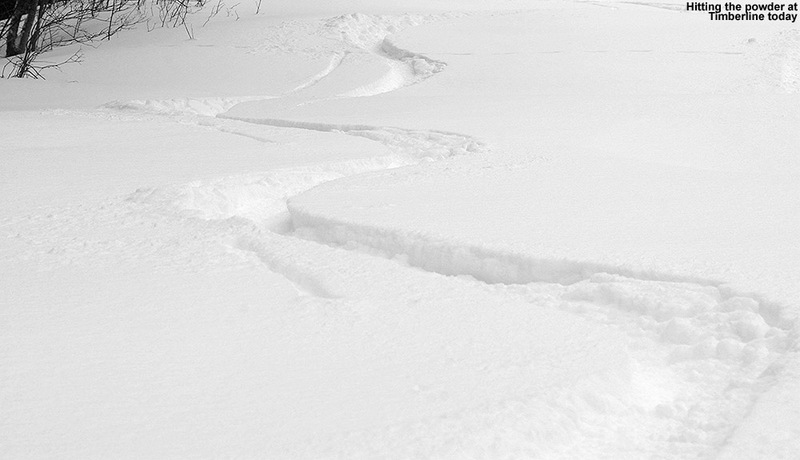 The combination of bumps and steeps was perfect ground for demonstrating how proper pole technique can really bring you to that next level of skiing in that terrain. Reaching for those pole plants on steep terrain can really keep that upper body facing downhill, so we kept pushing that upper/lower body disconnect because I could see that some of the boys couldn’t manage turns in the tighter lines like they’d want to. It’s really difficult to make rapid transitions back and forth and perform those especially tight turns if you upper body is constantly turning out of the fall line. I’d say Ty has got that down the smoothest of all the boys, and for some reason it’s just something he picked up when he was very young, but as a group I think it’s a process that will really reap rewards for the boys this season. 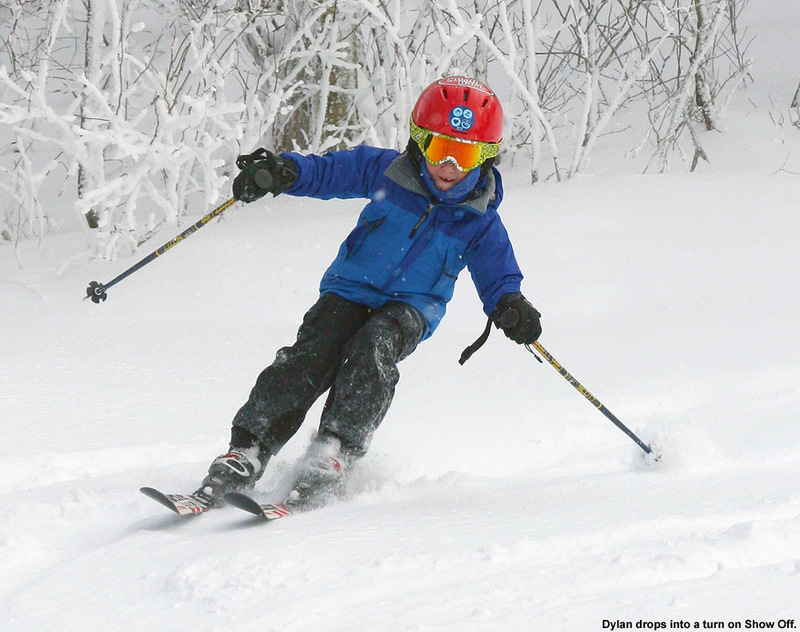 They’ve all definitely reached a level of skiing where they can handle whatever terrain you throw at them, and it’s time to work on the finer points of body positioning. After a couple of trips on Hayride, we finally mixed it up and visited Centerline, which of course yielded more fantastic bump lines. 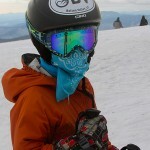 That let us head south to pick up the rail park, since Dylan was really looking to get into some park terrain. They had some long rails and boxes in there, and the funniest moment by far was when Dylan was skiing along a double box, and near the end of the second one, which was probably a couple feet wide, he ended up with a ski on the ground on each side. He continued to ride it, in classic “crotch grind” fashion, and held on right through. It was as impressive as it was funny, and the “crotch grind” definitely hung with us for the rest of the day. We met up with Connor’s group right at the end of the park, and we had a good collective run down Tyro. We didn’t want to do it, but the boys convinced us to drop below the Crossover back to the Gondola to catch a trip through the Half Pipe. It was a heck of a lot of fun though, and those massive vertical walls felt bigger than ever, so it was worth the extra work to get back to the Over Easy. We had really cooked ourselves pretty good with all those bumps, and I know that most everyone was enjoying that well earned tiredness at the end of the day. South winds were screaming along at the top of the Fourrunner Quad at the end of the day, and we’re rapidly approaching the end of the warm weather as a cold front nears the area. 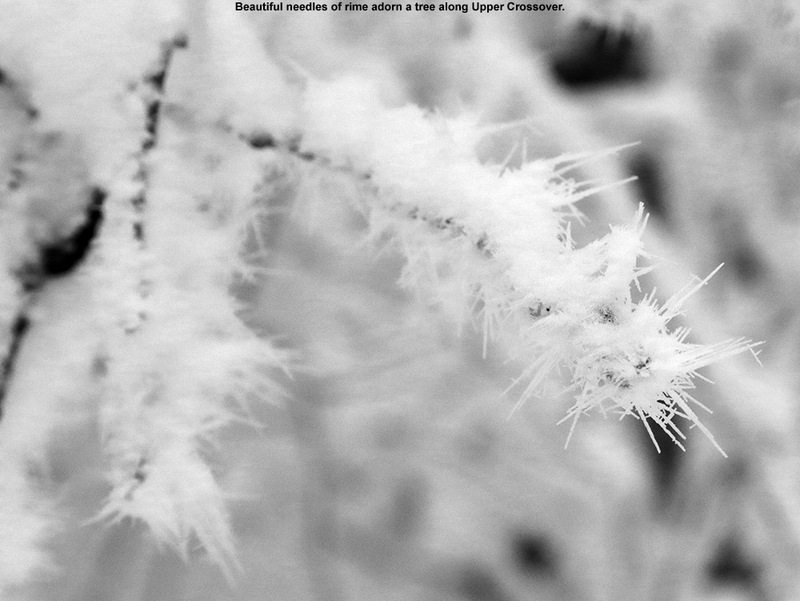 Snow is expected by overnight tonight in the higher elevations, and by midday tomorrow in the valleys. The biggest question going forward is about how much snow Mother Nature will put down by the upcoming MLK weekend. 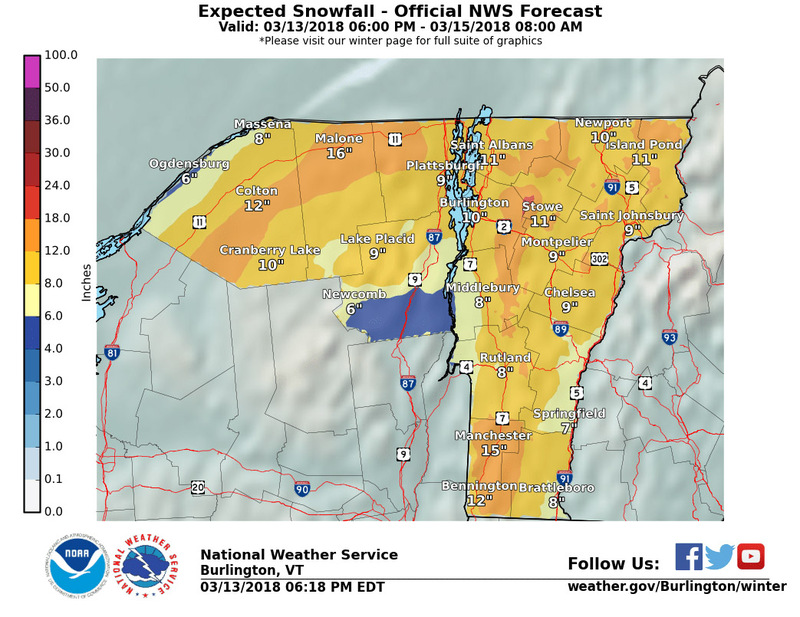 It doesn’t look like there’s a big enough storm coming this week to put down a real resurfacing to support lift-served skiing, so it may be time to hit the sidecountry/backcountry. But, there are a number of snow chances in the upcoming pattern, and you never know when the Northern Greens will pull 6 to 12 inches out of small passing systems. I was talking with E on the ride home about how, even though we had tons of good powder skiing days in the previous couple of weeks, it’s hard to think back to it when you’re out there on spring snow. It was a good break, but it will be nice to get the fat skis back out soon. Repairs on the Timberline Quad at Bolton Valley are complete, and although I heard that it actually started running yesterday, today was our first chance to check out the Timberline area and make some turns. Forecast temperatures in the 40s F are more like March or April than January this weekend, and with no need to head out early for powder, we opted for a warm, afternoon session. When we headed up to the mountain around 1:30 P.M. or so, temperatures both at the house (495’) and up at the Timberline Base (1,500’) were in the low 40s F, and although I thought we’d have generally cloudy conditions, it was actually mostly sunny. It’s great to have Timberline and that Timberline vibe back though, we pulled in and found probably a couple dozen cars present, and I was able to drop off E and the boys and park right below the lodge. 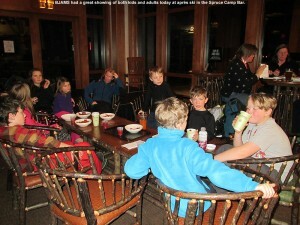 With the sun shining and mild temperatures, it was easy to think it was one of those spring Timberline outings. The Timberline trails were looking really sweet in the sunshine, and you could see that areas that hadn’t been groomed hadn’t even been tracked out. There were a couple of spots here and there where snow coverage was low, but they were pretty minor (aside from where a snow cat seemed to dig some holes on Showtime). I think the resort has got to be pretty happy that even the low elevation areas of Timberline are looking good with mostly natural snow. I know some snow was blown on parts of Timberline Run, but I’m sure that money has been saved on snowmaking for some runs like Showtime. I guess they could make snow in some areas going forward if they want to beef up the base for the spring. 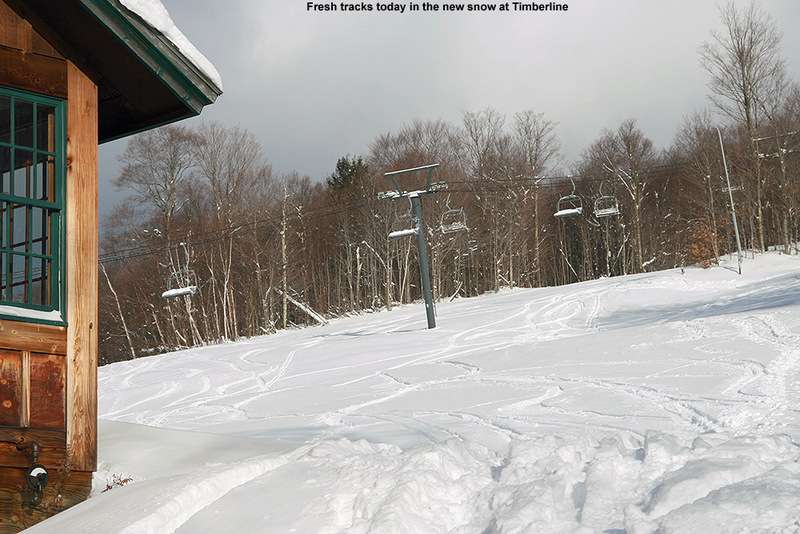 In the snow report they mentioned that there were a couple of trails closed for various reasons, but with Timberline in operation, the mountain is running at just shy of 100% open. 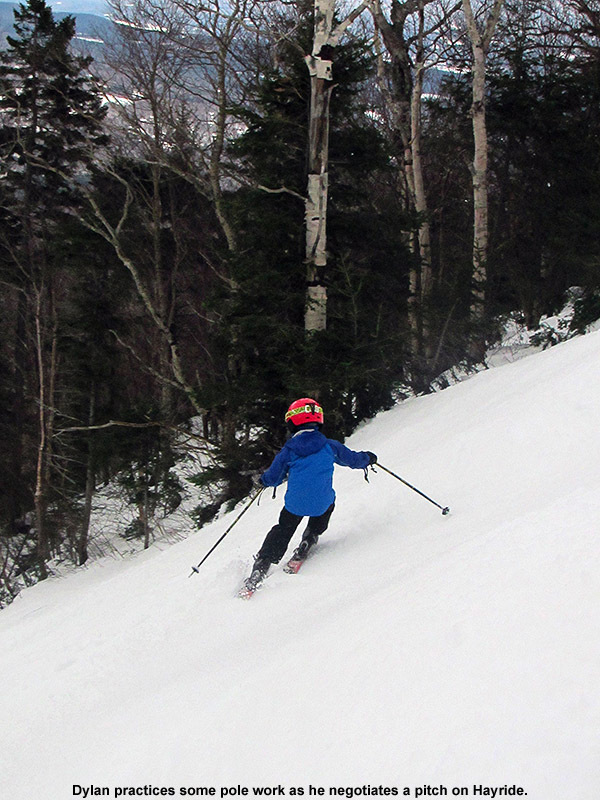 As they’ve often done in the spring, the boys went with their Telemark skis today to get in some practice, and the soft conditions were perfect for working on their turns. 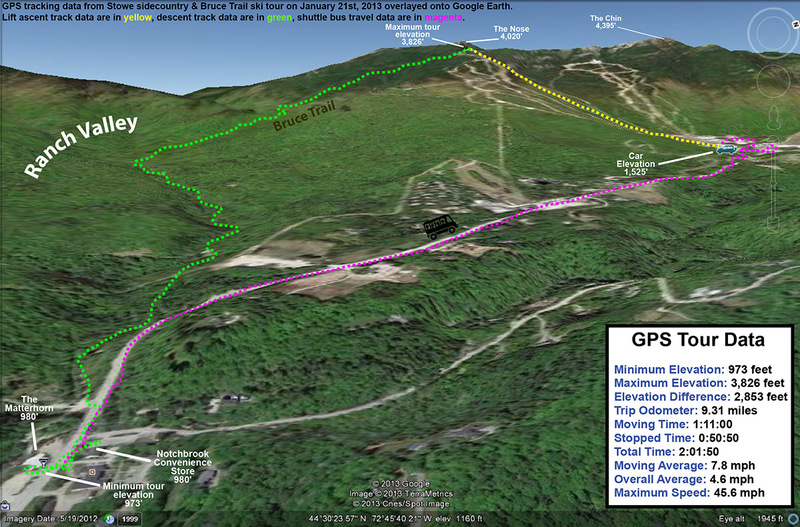 We did a couple laps on the Villager/Timberline Run route, with Sure Shot thrown in as well. Both boys went without the cables on their bindings, and while it worked well for Ty, perhaps because his new Telemark boots are stiff and supportive enough, it seemed a little sloppy for Dylan. I think his boots are worn in enough that he might need that extra tension from the cables. We ran into Luke and Claire and we were able get in some fun turns with them – Claire was definitely enjoying the ease of the Timberline logistics today as well. Everyone made plenty of soft carves in the snow today, and it looks like we’ll continue with these conditions tomorrow until things start to cool down at some point Monday. After that we’ll be looking for new snow to hopefully get back to powder conditions; it’s going to be fun to get back into some powder with Timberline in operation. 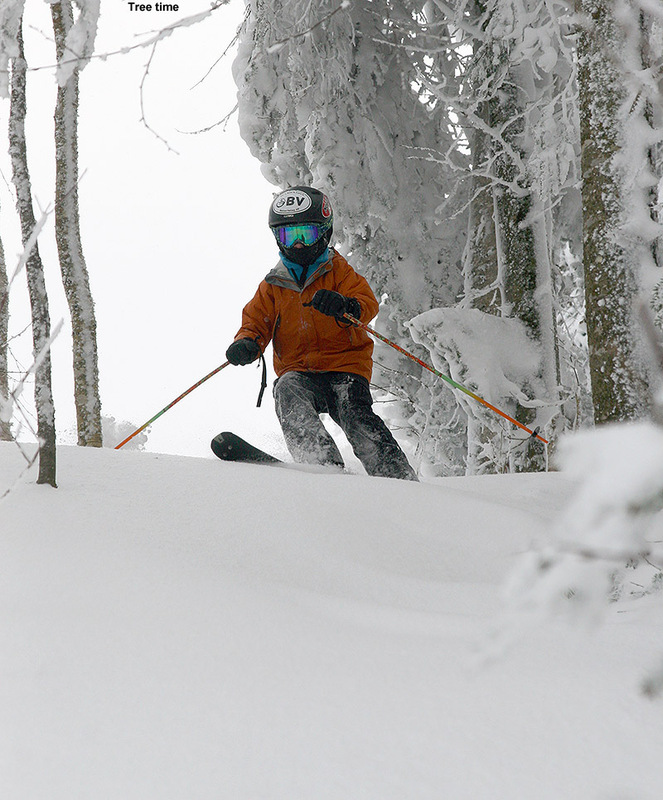 Dylan swishes through some of that Spruce Peak powder today. Ski program started up today at Stowe, and it was our first time back since our training day on December 15th. 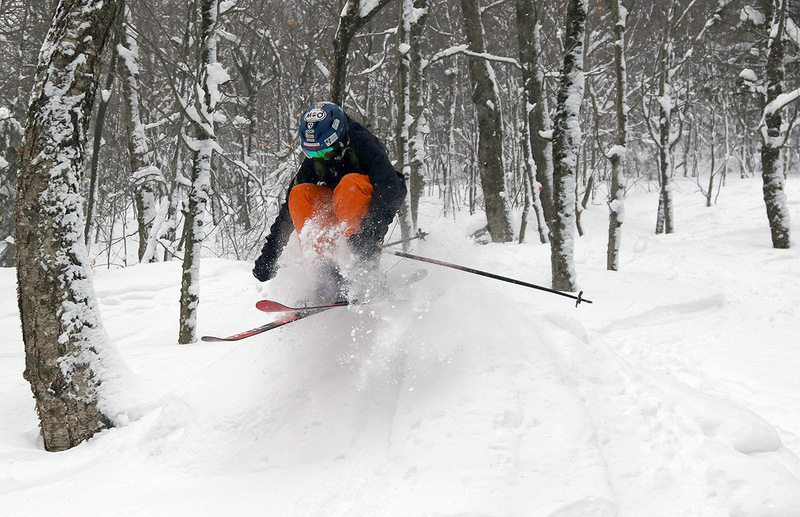 With all the snowfall over the past three weeks, and about a foot and a half in the past seven days, we were expecting great conditions. I found a couple inches of new snow on the snowboard at the house this morning, and light snow was continuing, so that was going to add an extra freshening to the surfaces. 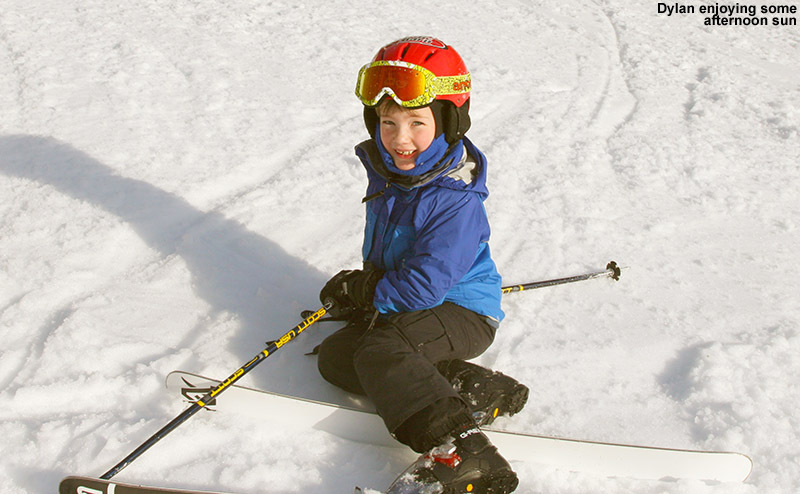 With temperatures in the 20s F, the mountain was set up for an excellent day for the kids. 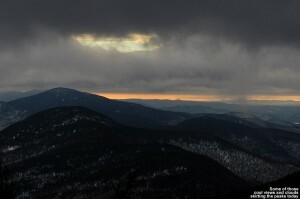 As we approached the mountain we got a special view as among the clouds we saw the slopes of Spruce Peak lit up with sunshine. Dylan initially forgot his ski jacket, so after dropping E off to take care of her coordinator duties, we popped back to the house to get it. On the drive we could see that there were all sorts of folks coming and going throughout the Stowe area, and it had the feel of a busy ski weekend. Our timing on the return was good though, as I grabbed a parking spot right near the drop off area. I think there’s something about arriving closer to that 1:00 P.M. period where you can catch those earliest skiers leaving, because another car was leaving from a great spot just a few spots down. From the parking lot I could see lots of fresh tracks in the area above Meadows, a classic sign of good snow at the resort. I had our usual group of boys today, and it was great to be back together for the season. Also helping out as a second coach was Ken, another BJAMS benefactor – it turns out that he enjoys bumps and trees and powder and all that, so we knew he’d fit right in with our young advanced group. We let the boys take turns choosing the runs, and Luke was fine taking ownership of the first warm up run off Sunny Spruce. For the rest of the Spruce Side, Jack took Whirlaway, and Ty took Green Acres and Spruce Line. There are still areas on the Green Acres headwall that should be avoided due to coverage, but down below in the glades and on Spruce Line there are no issues. Few people seemed to want to negotiate that headwall, so we essentially had all the terrain below to ourselves and there was plenty of fantastic untracked snow for us to ski. Over on Mansfield, Ty somehow got another one in the form of the Chin Clip Streambed, and then Dylan finished things off with some Nosedive Glades, or as the boys like to call it, “the middle of nowhere”. We started working on steep turns with the boys as we dropped into Green Acres, and I let them know that they could vary their turns anywhere from a continuous carve to a full blown jump turn. 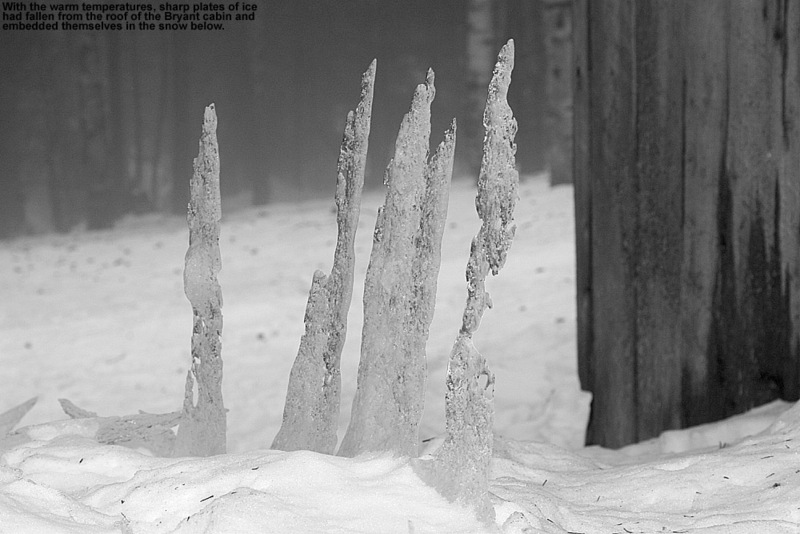 On the jump turn theme, we also worked on airs as we navigated the various icefalls in the Chin Clip Streambed. We talked about how one can take the airs straight if they feel that there is enough room to bleed that speed, or vary their landing angle with jump turns to the point where they have cut down the speed to where it’s reasonable. In line with the jump turns, pole work and timing were also a focus since we had a chance to get into plenty of mogul terrain – Dylan still needs to get his timing down on steeper terrain, but he was working on poles on lower angle terrain to get there. We had a really good group for après ski at the Spruce Camp Bar, and it was a really busy après session there because it actually wasn’t easy to find tables to get everyone together. 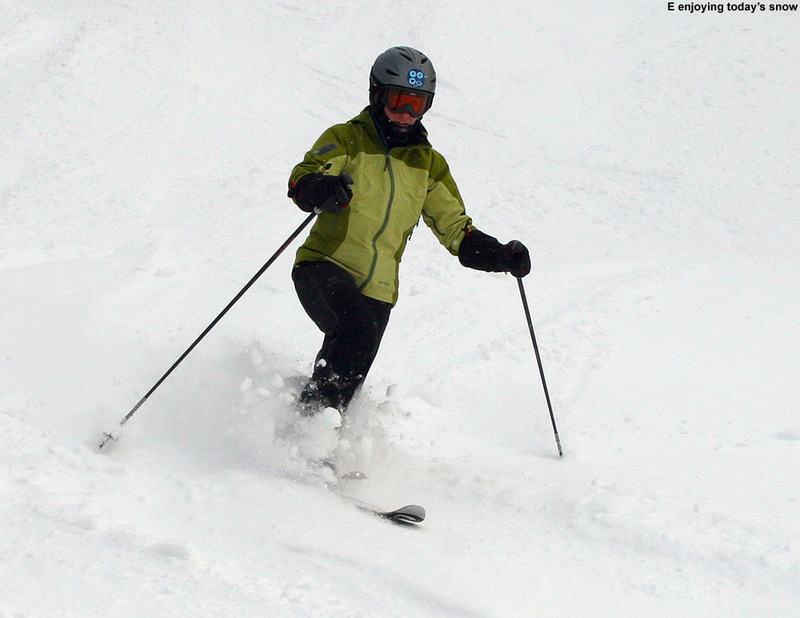 Conditions on the slopes are very good overall; the fact that the snowpack depth at the Mt. Mansfield Stake is at 50 inches (roughly a foot above average), and the way the Chin Clip Streambed is skiing well, can attest to the sufficient base depths. There are still a few spots on most steep trails we visited that could use a bit more cover, whether due to the fact that they need a slightly deeper base, or traffic has worn them down. 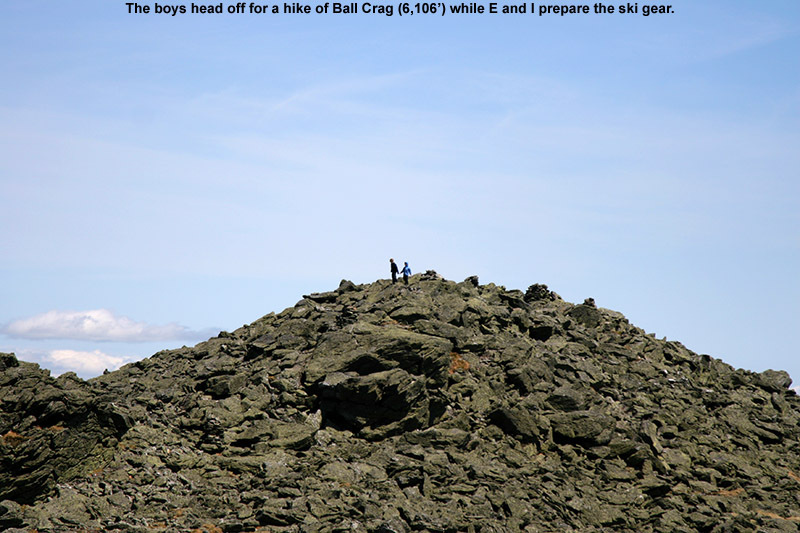 A notable spot would be the Green Acres Headwall, where some of those nasty, jagged rocks are almost covered, but not quite there. 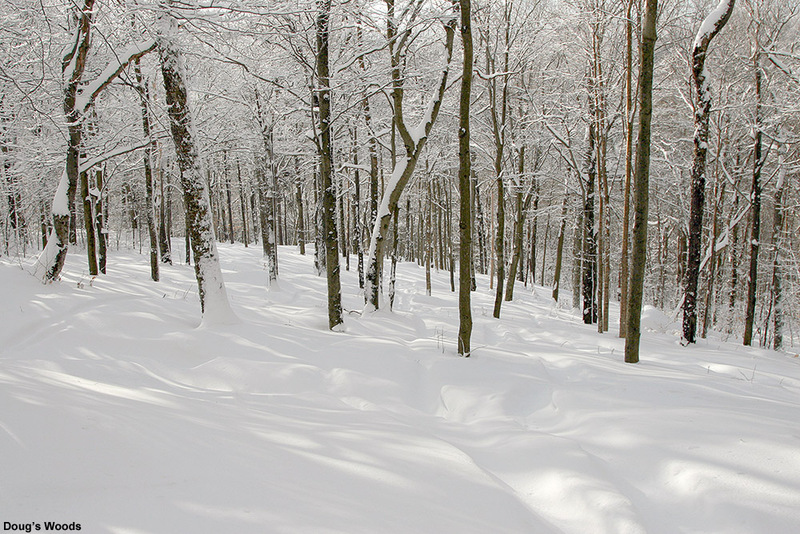 Also, those tough to cover spots such as the south-facing terrain on the steep, lower spots of Spruce Line could use more snow. Another foot or two of base would take care of those issues, but the mountain must be close to 100% open from what we saw. Likewise we found some slick spots, typically in areas where snow was made, but the surfaces were almost exclusively packed powder and powder – we cut over to the area above Meadows whenever we could on our runs on Spruce Peak and there were still plenty of lines with powder in them for the boys to enjoy. It looks like temperatures are going to be a bit warmer over the next week, but we seem to be staying in the storm track so the snowpack in the mountains should continue to build. 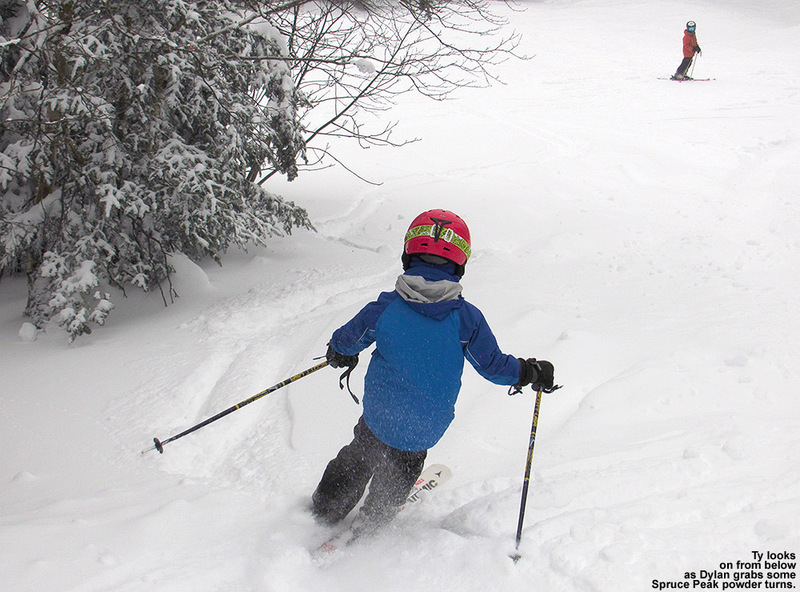 The Vermont ski areas received up to a foot of new snow in the past 24 hours, with the highest totals in the northern half of the state, and a lot of variability up and down the spine. 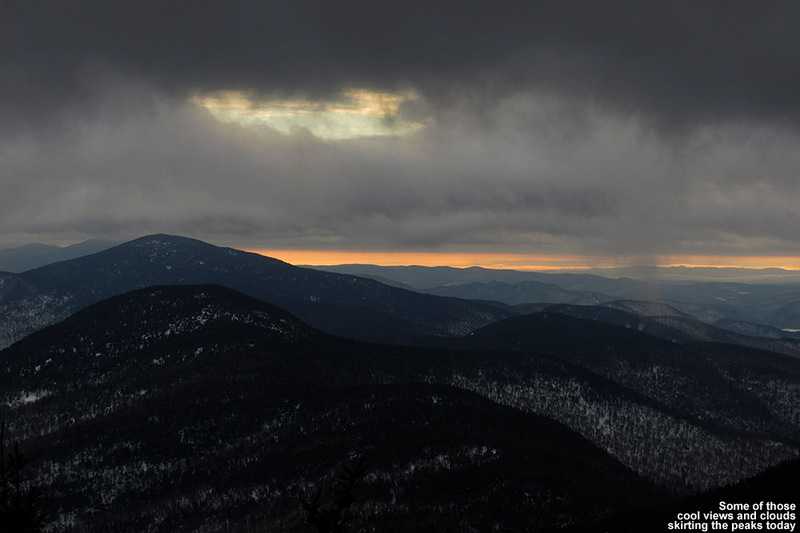 Morning snow showers began to clear out to blue skies, as temperatures sat in the mid 20s F in the valleys and upper teens in the higher elevations. 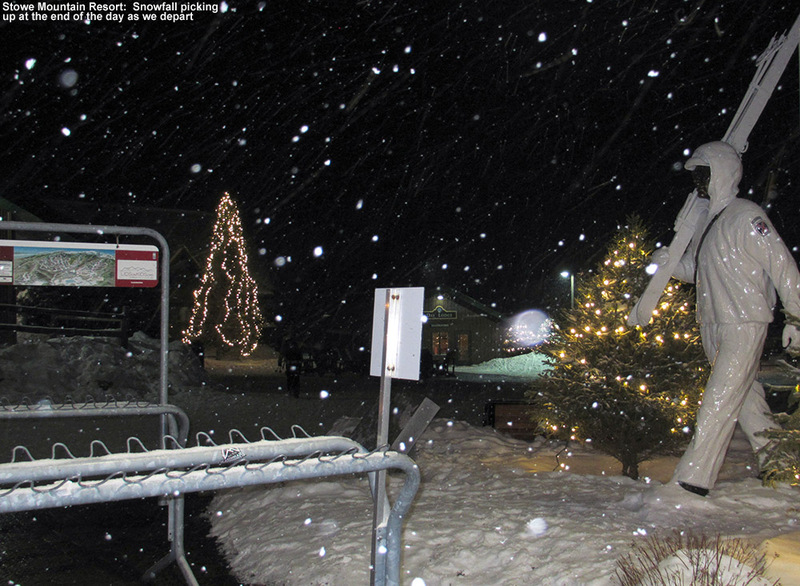 Winds were strong in the morning, and the Bolton Valley snow report indicated that the Vista Quad was on wind hold, but all the other lifts slated to open looked like they would be on time. We got a call from Stephen indicating that he was up at the mountain with Helena, and that things were a little crazy since all the weekly ski programs were back in action this weekend. We eventually got the boys motivated to head up to the mountain in the late morning, and while the parking lots were filling up, after I dropped E and the boys off at the village circle I got a rather neat parking spot. The main tiers were full and the attendants were starting to fill those other nooks and crannies, and they parked me and another vehicle right along the entrance road near the Courtside 1 Condos. The spots were sort of created due to the way the plowing was done, and I can definitely say it was the first time I’ve every parked in such a unique spot. 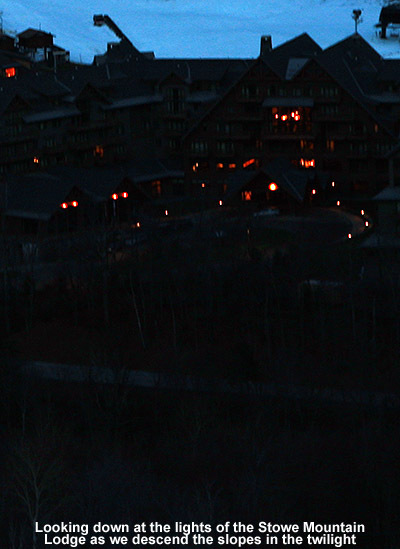 In any event, it meant that from the car it was a pretty quick shot right up to the lodge. E and the boys had stopped in the ski shop to purchase a couple of gifts for upcoming birthdays, and then I met them out near the Vista Quad. Any congestion from the weekly ski programs was gone, because there were no queues and we headed right to the Vista Summit. 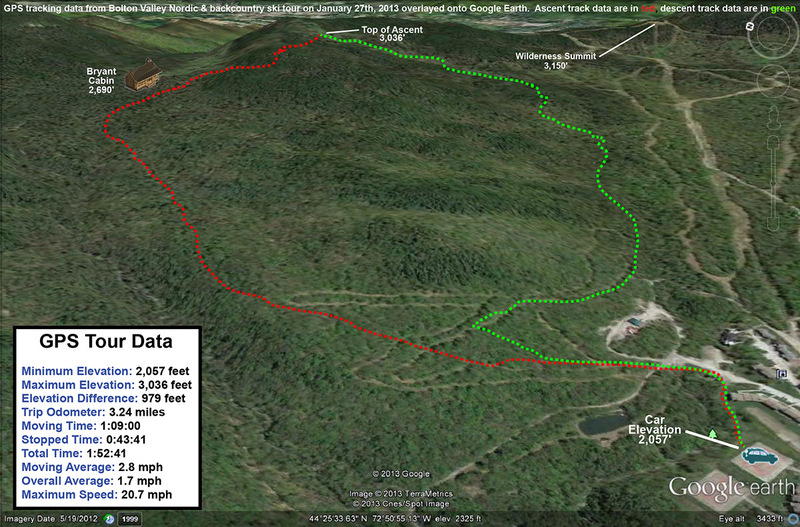 Winds had been rather insignificant at the base, but they picked up a little in the higher elevations. We could see that the summit areas looked rather wind scoured, but for our descent we checked out Hard Luck Lane and hung to the left to see if we could catch some soft snow. 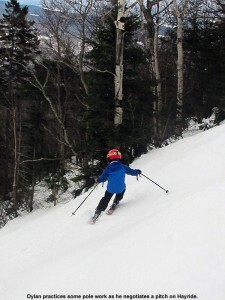 There was a little soft stuff, but between the blowing wind and the hard scoured snow it was still “loud skiing”, as E put it. We shot down onto Hard Luck, and the snow was still wind scoured and firm for another couple hundred feet before we started getting into protected terrain. Then things started to get nice; we began finding soft snow and powder along the edges of the trail, and once we descended a bit more we cut through the trees to get over to Show Off to even more protected terrain that I expected to yield some excellent turns. The trees were just choked with bottomless powder, and in terms of snow quality it was really night and day from up in the exposed on piste areas. The bottom half of Show Off held excellent snow that featured anywhere from a few to several inches of powder over a soft base. Ty had fun jumping off the side of Little Rock, one of his favorite spots. We slid into the powder along the Sherman’s Pass/Show Off intersection, and then caught the Vista Quad Lift Line and terrain park below Mid Mountain. There were just a couple of spots where coverage was bit thin on the lift line, but it’s really progressed in the past week or two to a point that you don’t have to worry about avoiding anything. Ty and Dylan discovered that the Jungle Jib was open with features (including the new “Oil Can” oil tank jump) so they couldn’t get enough of that. Dylan leans into a turn on Show Off today. Dylan called for the Mid Mountain Chair on the next run, and we got to check out the Enchanted Forest where we found top notch packed powder and powder off to the edges. 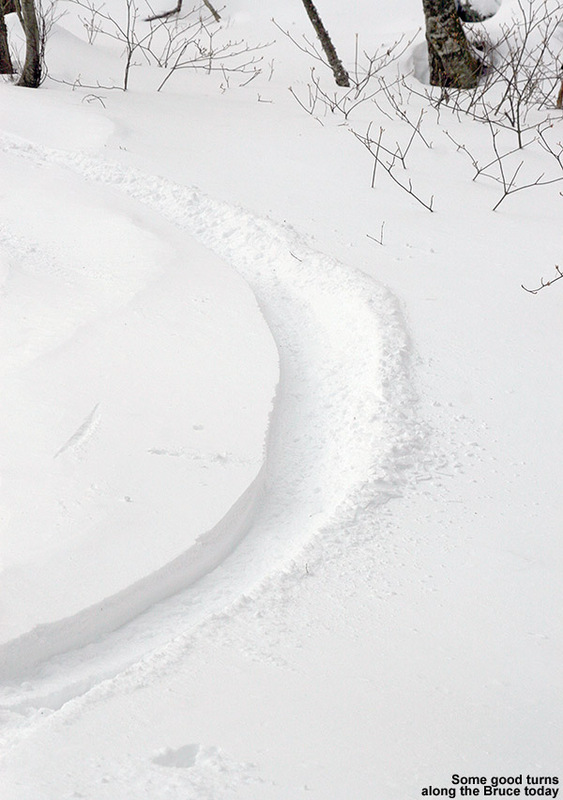 A quick measurement of the powder depth there on the lower mountain revealed 14” above the previous packed layer. The Enchanted Forest was definitely a good choice below Mid Mountain. We had time for one more run before Ty needed to head off to a birthday party, but Dylan’s hands and feet were getting a bit cold, so he headed inside with E while Ty and I took the last run together. 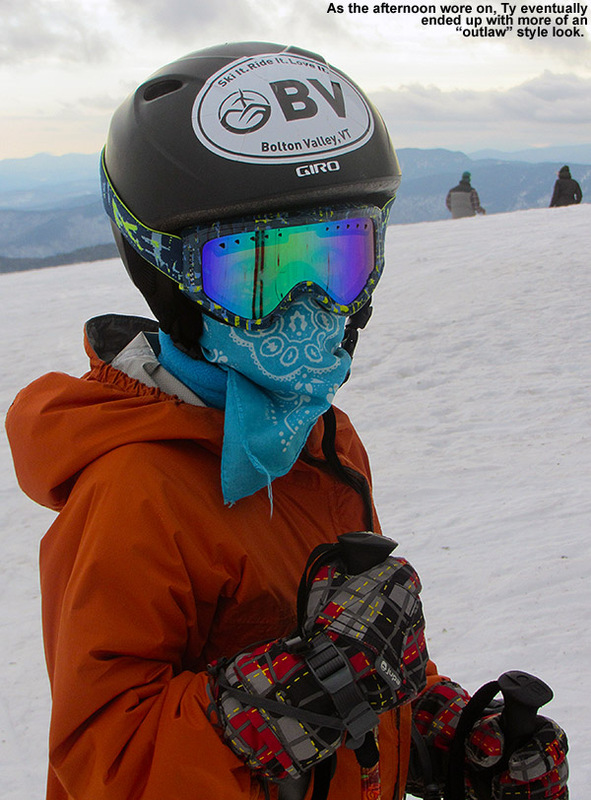 Ty wanted a Vista run, specifically to hit Alta Vista, which is one of his favorite trails. 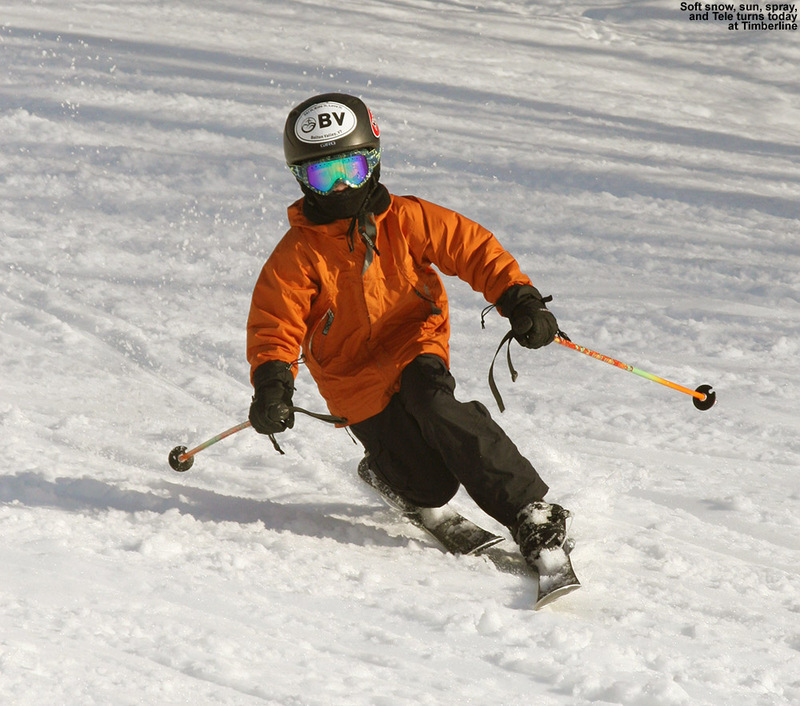 Unlike many of the high elevation spots, Alta Vista was well protected from the westerly winds, and the skier’s left offered up great soft turns on packed snow as well as some powder. I was amazed that people hadn’t been in there yet – Ty had definitely made a good call. We dropped in and out of the powder on that left side, all the way down to Sherman’s. 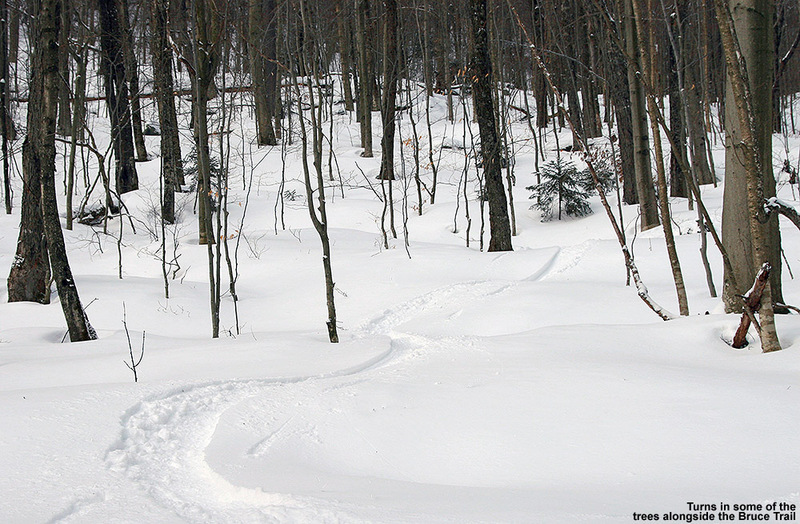 I showed Ty Schuss, and a nice untracked line through the trees that he could hit. 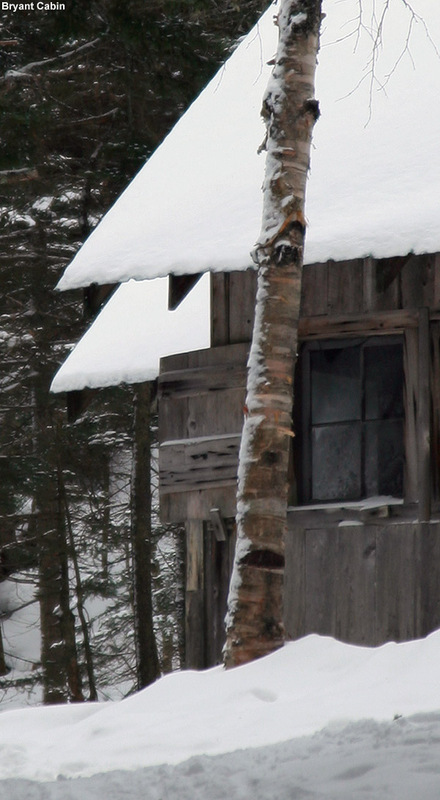 He had to get through a branch in there, and like a true tree skier her put those hands up to protect his head and face while he blasted through. Schuss had a few slick spots at the top where it was more exposed, but it had filled in nicely in the bottom half. We traversed our way off Sherman’s Pass over to Show Off, right at the level of Big Rock/Little Rock, and Ty was very impressed with how I’d managed to get us over there. We finished off that run with another pass through The Enchanted Forest/Jungle Jib. We were totally out of synch with Stephen and Helena today, since they were just going into the lodge for a break when we first spotted them, but at least E and Dylan got to see them when they headed to the lodge. Although we felt as though we’d arrived somewhat late, the unloading area in the Village Circle was absolutely mobbed with people arriving around 12:45 P.M. as we were leaving. Those folks may have been coming for an afternoon or twilight session, but either way, it looked like the mountain was getting a full slate of visitors. Parking spots were at a premium and we had someone waiting for ours as we packed up the car. We even saw that they were parking cars down at Timberline and the shuttle was running. From what I’ve read on the Bolton Valley Facebook Page, it sounds like the mountain is shooting for having the mechanical issues addressed to enable opening of the Timberline Quad next Saturday, January 12th. A lot of people are going to enjoy having lift access to that terrain, although it does mean it won’t be quite the perpetual powder playground it has been the past couple of weeks. On that note, our next storm is on the way and snow is supposed to be building in tomorrow with some potentially nice accumulations for the local mountains. 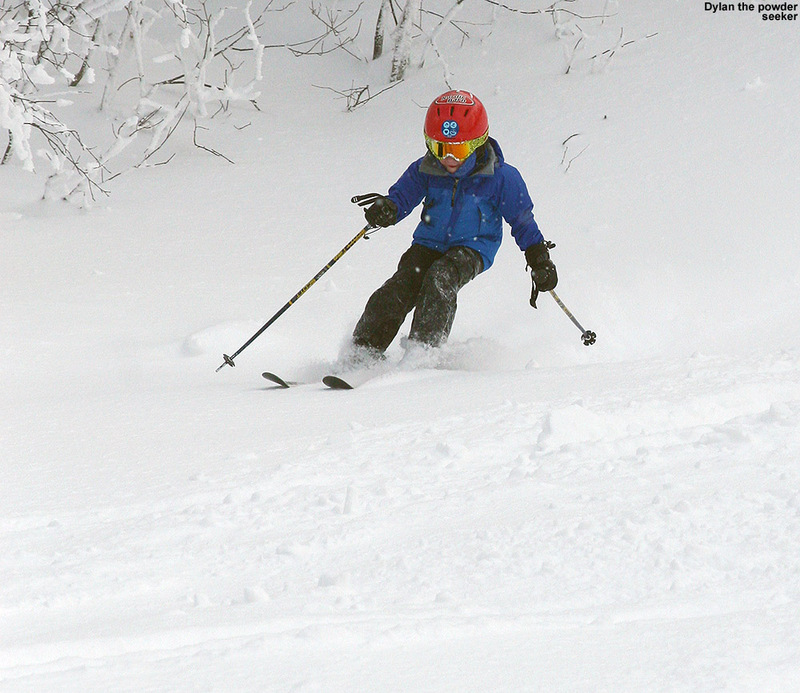 Mother Nature to Bolton Valley: here’s your new year’s refresher. The arctic front that came through overnight dropped an inch or two down here at house, but 4 to 5 inches up on the mountain. 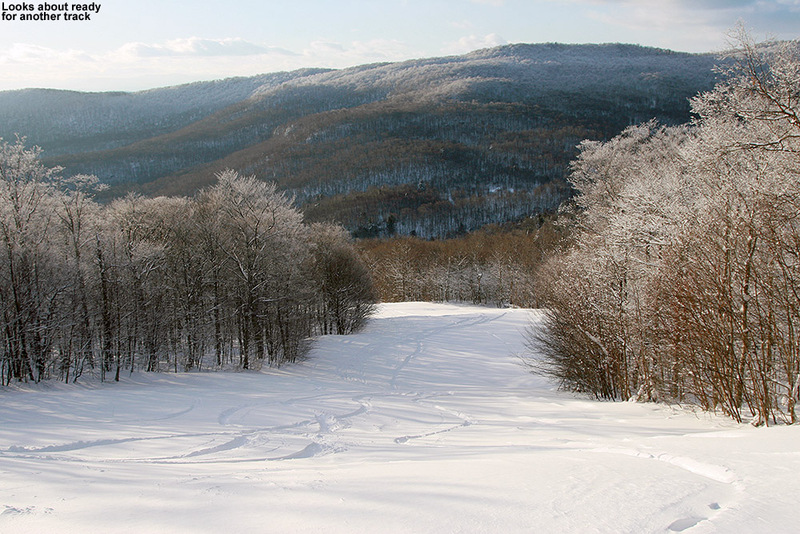 It also brought in some colder air – single digits were reported on the Bolton Valley snow report in the morning. While that was cold enough to make riding the lifts less appealing, it sounded like some good temperatures for earning turns. Even though it’s already been a lengthy week of powder skiing, the allure of getting in another workout on yet more powder atop all the snow we’ve had over the holiday break was too much to resist. I hadn’t thought that there would be much rise in temperatures today, but when I got to Timberline the temperature was already up to 15 F, so combined with the sunshine and minimal wind, it was much warmer than I’d expected. There were a few other cars in the parking lot, and I could see that several sets of tracks had been carved into the new snow at the bottom of Showtime. The Twice as Nice skin track was in great shape; with the new snow already well packed by various skiers, the ascent was very quick. At the top I decided to head into Doug’s Woods through the upper entrance for a change of pace and to see if the snow in the trees was more protected from any winds. The snow in Doug’s Woods was fantastic, bottomless powder, but unfortunately it was just too much of it for some of the mellower pitches. I measured 24” of unconsolidated snow atop the base, and even with my fat skis I was moving slowly when the pitch wasn’t there. I slid my way back to the car and was about to gear down to head home, when I noted the time and reconsidered. I had plenty of daylight left and it was just too nice out, so I headed up for another lap. I was feeling the rhythm on that one, and it only took about 20 minutes to ascend Twice as Nice proper. At the Timberline Mid Station I looked upward toward Intro and saw that it was pretty wind blasted, and that made the decision easy to descend from where I was. This time I opted for Spell Binder, which had just a few tracks on it. 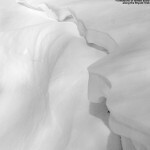 The headwall held great snow that really hadn’t been affected by wind. Snow was actually excellent from top to bottom, and there was enough consolidation from either previous rounds of wind or skiers that bogging down in deep powder on lower angle sections wasn’t a problem. It’s been quite a holiday week for turns, with at least some new snow each day, and bigger shots of snow on some of them. 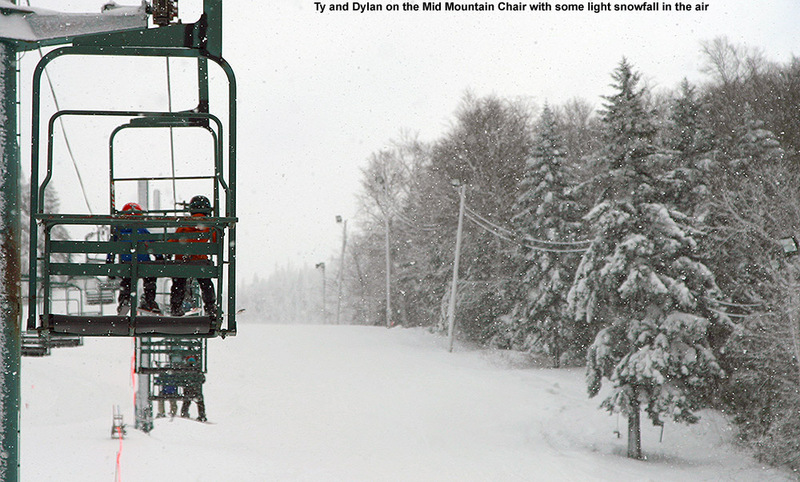 This last snowfall actually put Bolton Valley past 100” for the season, and brought the Mt. 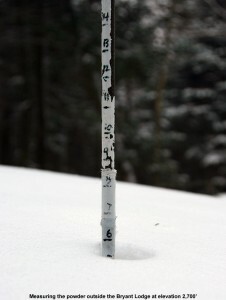 Mansfield Stake to a depth of 46”, both good signs as we head into January. The next chance at snow appears to be this evening with some snow squalls from an upper level trough.